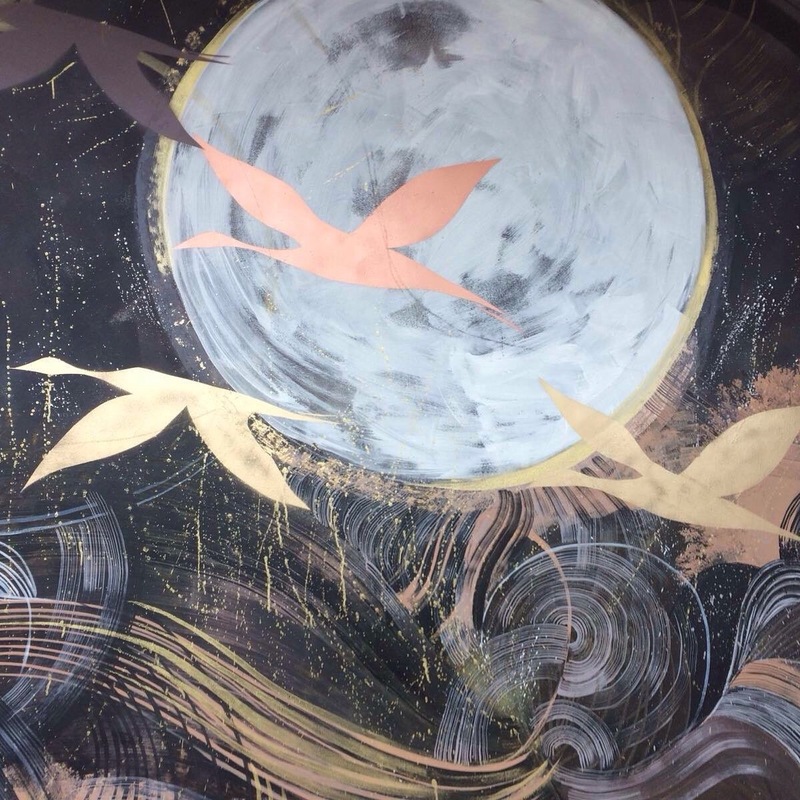 Bar Opus joins forces with Brummie artist for exhibition. Bar Opus, one of Birmingham’s best independent city bars, is exhibiting works by a city-based artist for its fourth art exhibition in support of local talent. The bar at One Snowhill is showcasing works by Tom Parry, whose art of Birmingham landmarks is sold under the Made On The Canal brand. Opening on Thursday 22 March, the exhibition will comprise a number of A4 and A3 hand-finished artworks and 3D pictures in different media, including watercolour, paint and ink, that depict landmarks such as the Library of Birmingham, Victoria Law Courts, Alpha Tower and Edgbaston Waterworks. Tom, a graduate of Birmingham City University, takes up to 20 hours to complete his intricate pieces of 3D art, which involve gradually building up elements of the architecture 1mm at a time and cutting out recesses to create complex layered pieces. He said: “I pride myself on producing affordable pieces of art and I’m really thrilled that Bar Opus has asked me to submit some pieces for its next art exhibition. It’s an amazing opportunity to have my work in a busy city centre bar and it’s great that the bar continues to support local artists such as me. Sounds a fantastic opportunity to see some fantastic local affordable art in a fabulous independent bar. Opus leads the way in showcasing Birmingham’s independents. Opus one of the top fine-dining restaurants in Birmingham is leading the charge for independents, joining forces with some of the best talent in the city. Billed as a celebration of the bespoke, Opus in Cornwall Street is keen to support local businesses that offer something different from the norm and has so far linked up with artists and an award-winning wine merchant. Pawel Skrzypinski, general manager at Opus, said: “Birmingham is an exciting, diverse city in which to live and work and if you are willing to meander off the beaten track through our lovely city centre, you will be rewarded with shops and artists showcasing an individuality and tailored approach that makes you feel special and appreciated. Over the summer, it is collaborating with Loki Wine, the award-winning wine merchant and wine bar based in Great Western Arcade, enabling customers at both venues to take advantage of some fantastic offers. Loki is offering 15% off the Loki Wine Tasting Card for Opus Loyalty Card holders, while Opus is offering all holders of a Loki Wine Tasting Card 25% off all bottles of wine purchased (see T&Cs online) and £10 off the flight of five wines that accompany their weekend five-course tasting menu. Sculptor Viv Astling, OBE, has two pieces of art being displayed at the restaurant over the next few months. An elected member of the Royal Birmingham Society of Artists (RBSA) and a former student of the renowned sculptor John Tonks, he uses English limestones particularly from quarries in Portland, Dorset, and Ancaster, Lincolnshire. His piece Turning Point is being displayed at Opus’s reception desk, while Ariel is on display in the bar area. Bar Opus at One Snowhill has joined forces with Jewellery Quarter-based Argentea Gallery to feature a selection of photographs by Birmingham multi-media artist Sophie Hedderwick from her critically acclaimed series Swift As A Shadow. Argentea is a new gallery in the Jewellery Quarter launched by Jennie Anderson and is dedicated to showing the very best contemporary photography from both British and international artists. Also at Bar Opus are five works by Birmingham-born innovators Key & Tam, known as LOWLFE. The pair take everyday objects, such as phones, plants, coins and dead insects, and introduces them to the world of miniature people in whimsical settings. The new collaborations follow Opus’s inaugural art exhibition with Mark Howard of independent fashion store Disorder Boutique earlier this year, when the walls become a canvas for his creations. Pawel added: “The past few months have been exciting as we have expanded our support network of leading independent talents and we’re looking forward to continuing our efforts to introduce other great Birmingham names to our customers. So make sure to watch this space". Great to see such a fantastic collaboration between two of the cities best independents. Also note that Opus are offering 50% off select wine in August. It includes a range that covers most tastes. From lighter summery whites to fruity cherry-like reds and rose wines a bargain is to be enjoyed with the new set price menu or tasting menu. 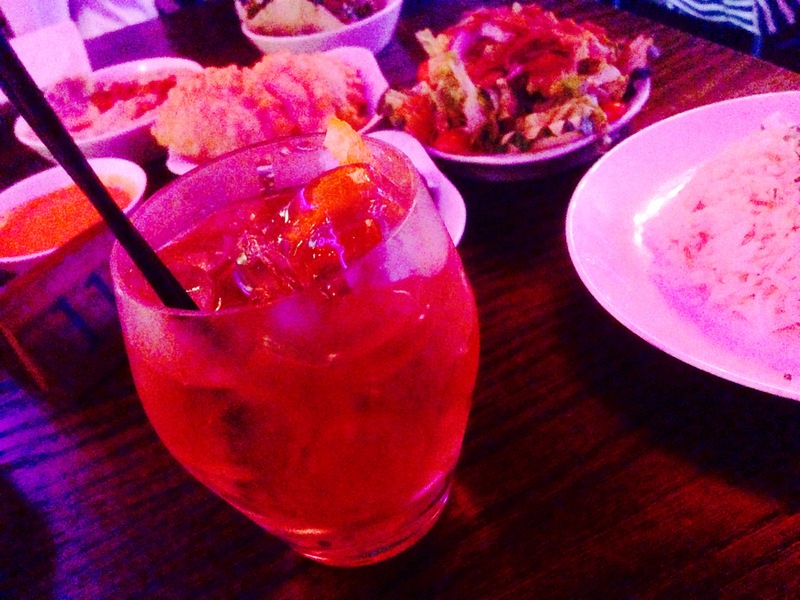 In Bar Opus news become all Italian and try a Rose Aperol Spritz with complimentary nibbles for £5 from 2-5pm. Aperol Spritz is one of the finest drinks and with added nibbles and hopefully sunshine on the Bar Opus terrace one of the must things to do this Summer in Birmingham. Go on try it! All photos and information courtesy of Opus, Bar Opus and Clive Reeves PR with thanks. 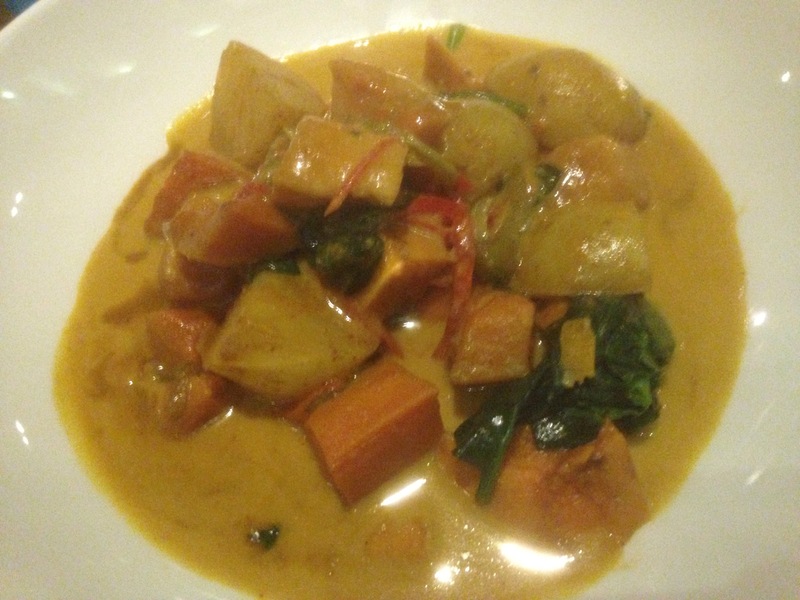 Vegetarian dinner at Cheval Blanc, Moseley. April 12th. 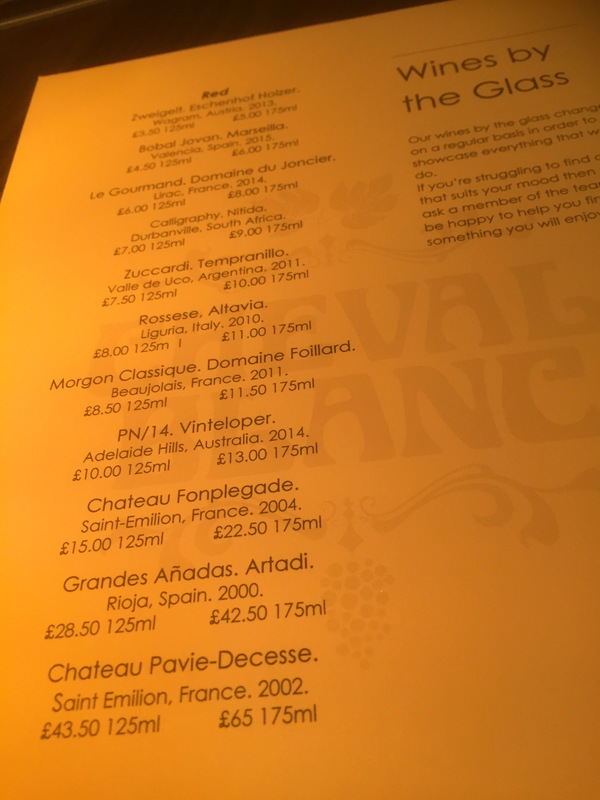 Cheval Blanc is becoming the go to place for wine, cocktails and food in Birmingham. Residing in Moseley it sits next to The Dark Horse, colourful from the outside and inviting. Owned by the same team as The Prince of Wales, The Dark Horse and The Royal Oak in Stirchley, Ruth and I have visited for drinks but not eaten there as yet (must do soon) and can thoroughly recommend it for its impressive wine list and winning cocktails. There are regular events on Wednesday and Thursday evenings including exclusive dinners and master classes. 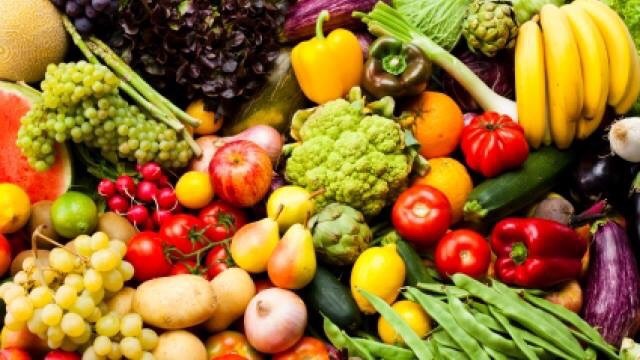 On April 12th, sees a Vegetarian evening of food. Try a five course meat free menu to prove that veggie food isn’t all about risottos and Nut roasts. Chef Cydric Has created a menu that captures the season and is as enticing sounding as you could find anywhere on a midweek evening. 5 Courses for a bargain £17.50. Complimentary glass of Cava for Les Amis de Cheval Blanc Cardholders. Unfortunately as it’s the Easter holidays Ruth and I can’t make it on the night but hope there’s another one in the pipeline soon that we can attend. Please support this excellent vegetarian event in Moseley. 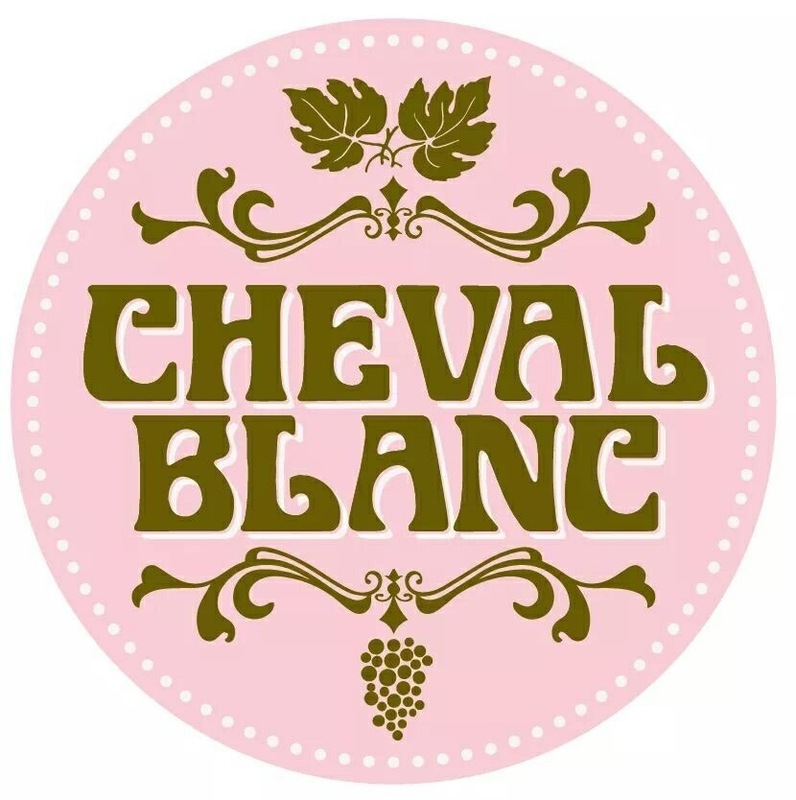 Cheval Blanc, 145 Alcester Road, Moseley, B13 8JP. The first 5 photos are my own and the others courtesy of Cheval Blanc. 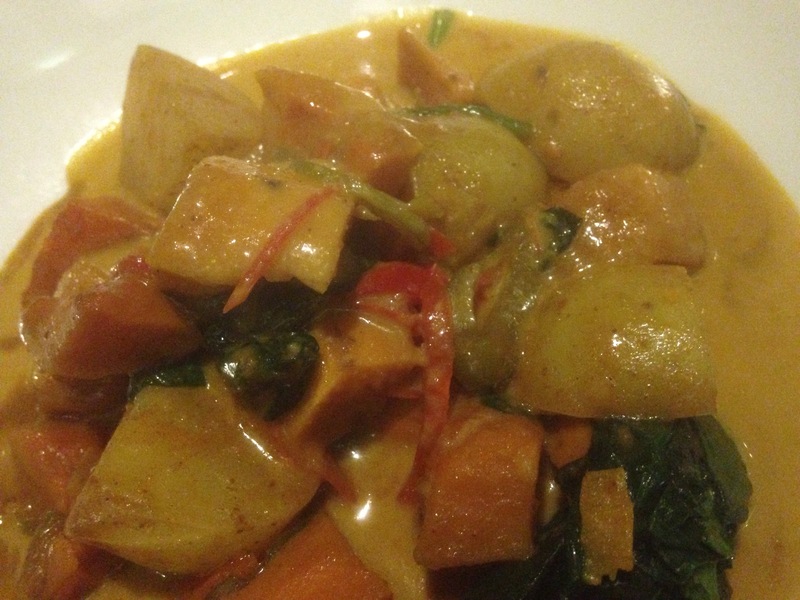 Restaurant Review: Sabai Sabai, Moseley, Birmingham. Picture the scene. Out with Ruth, a romantic meal cut off from the main Moseley drag on Woodbridge Road. A window table, private, candlelight, very nice. When suddenly out of no where a group of drunken men walk past and decide to pull faces at the window and shout out things you hear on a Saturday night, breaks the romance and a scene remembered to this day. Then picture the scene when for Ruth’s Birthday meal we arrive at the same restaurant and see a table for two free in the same window, hearts miss a beat and words I’m not sitting there pass through our mouths. Fear not there are also free tables inside so we sit comfortably away from the door and aforementioned window. 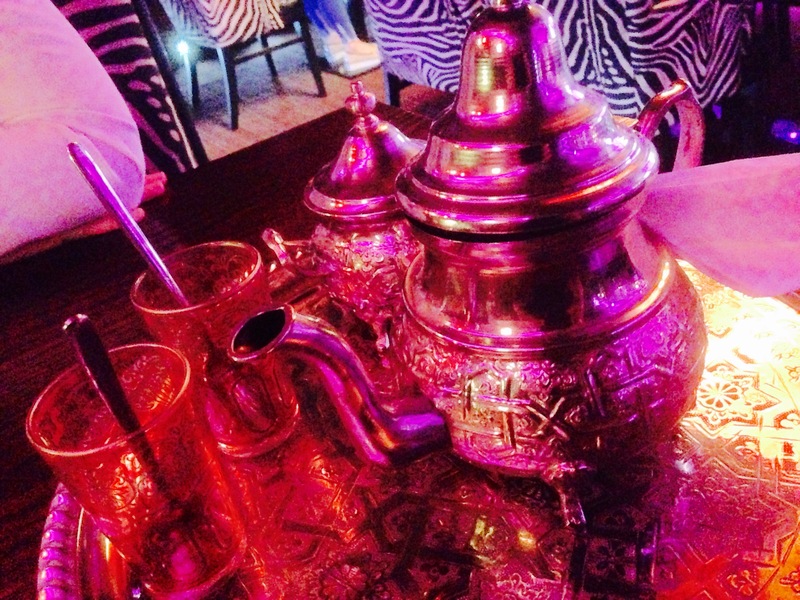 That’s the story of one of our many visits to Sabai Sabai in Moseley. One of three Thai restaurants owned by Torquil and Judee Chiswick. The others in Harborne and Stratford Upon Avon have their own identities, their own regulars. We though love the intimacy and bijou feel of the original, (10 years old) it’s perfect for couples and for a little romance. 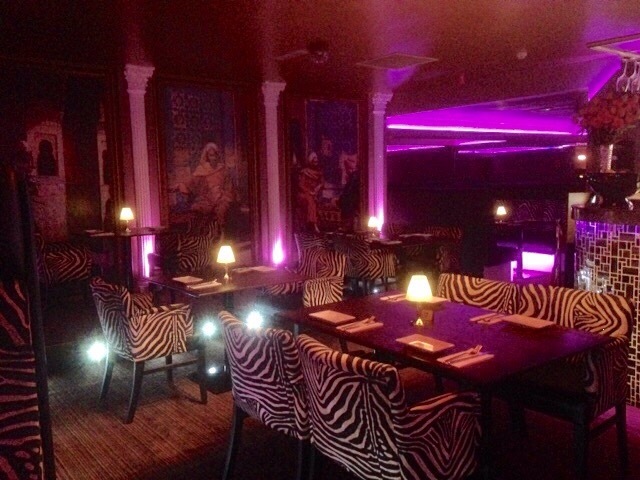 The Bohemian ways of Mosley Village dictate that the decor is as rich with colour as the food. 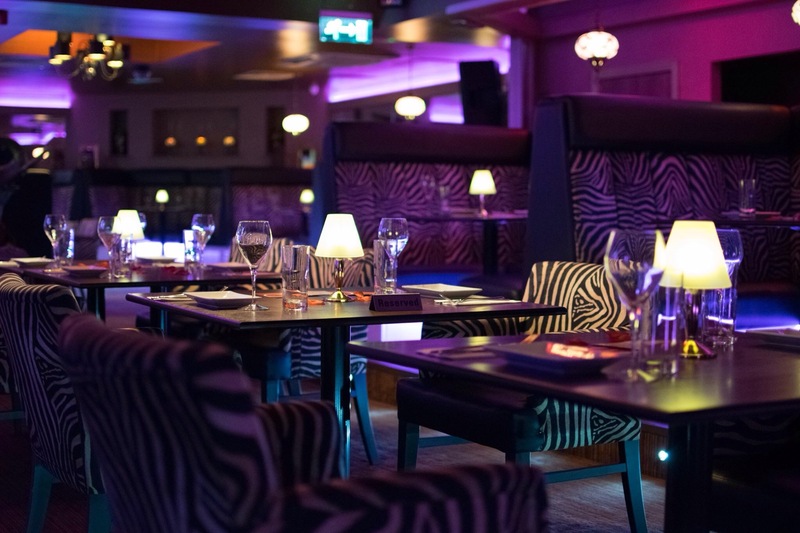 There’s a good buzz about Sabai Sabai and it’s popularity desires you book on a weekend. 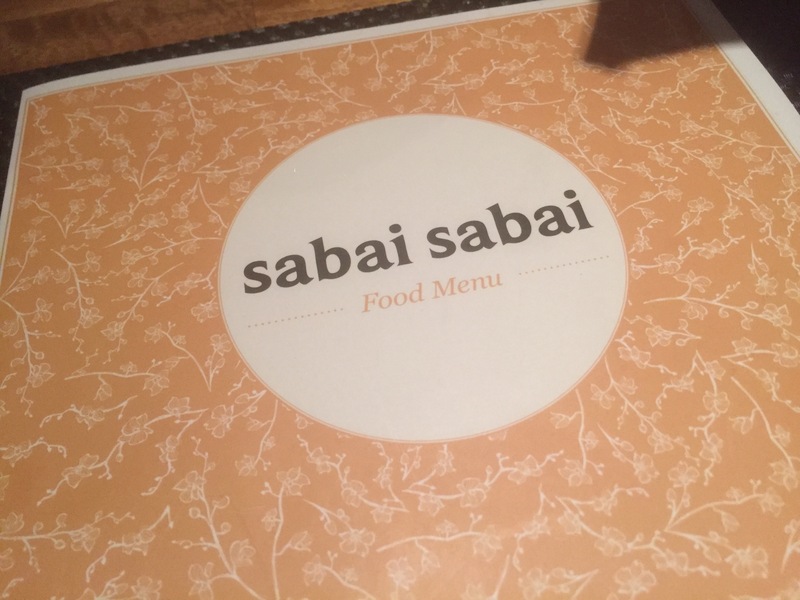 Having recently won the Best Oriental Establishment at The Food Awards, held in Manchester, Sabai Sabai’s star is ascending. The recent opening in Stratford Upon Avon is the first out of Birmingham and a hit already with the theatre crowd. And then the food. So often Thai food can be so richly spiced that Fireman Sam needs to be called out to rescue the choking Norman. But here delicate flavours are contrasted and compliment perfectly the booming spice that makes these dishes whisper fire. Kanam Jeeb Pak starts me off. 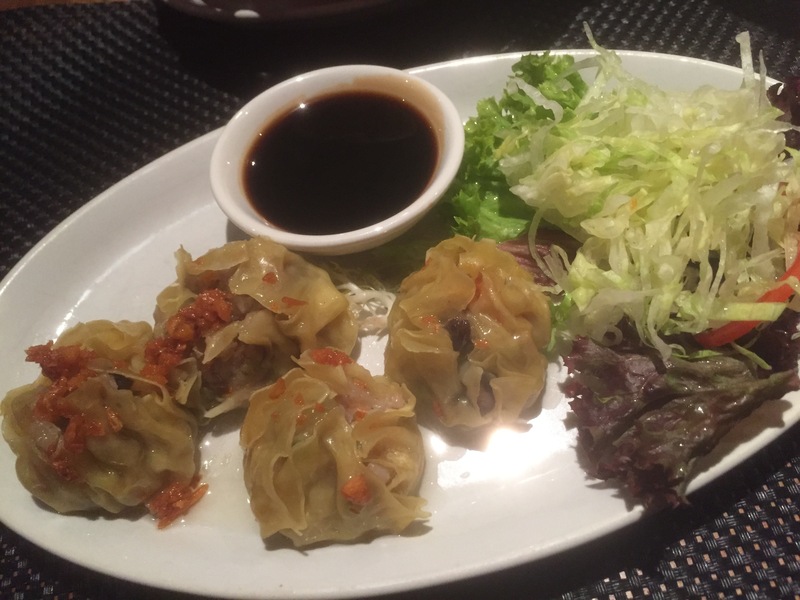 Steamed mix veg dumplings topped with crispy garlic and served with a delicious sweet dark soy sauce contrasting perfectly the depth of flavour in the dumplings which are perfect for dipping. Balanced flavours, crisp and firm a delight. 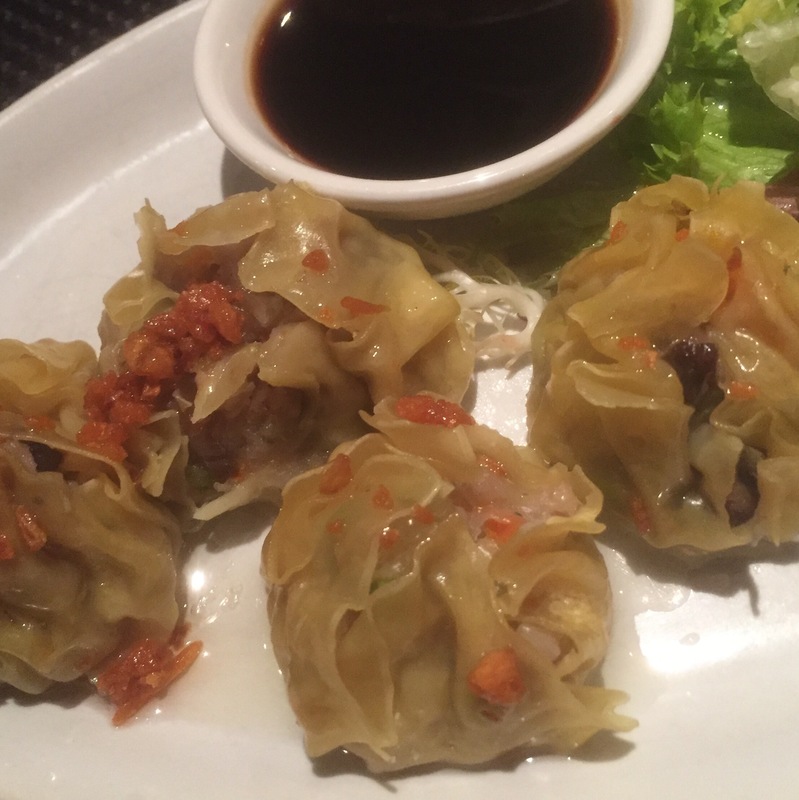 Sabai Sabai have a huge choice for Vegetarians from stir frys to a recommended Phad Thai and a tempting set menu for the undecided. 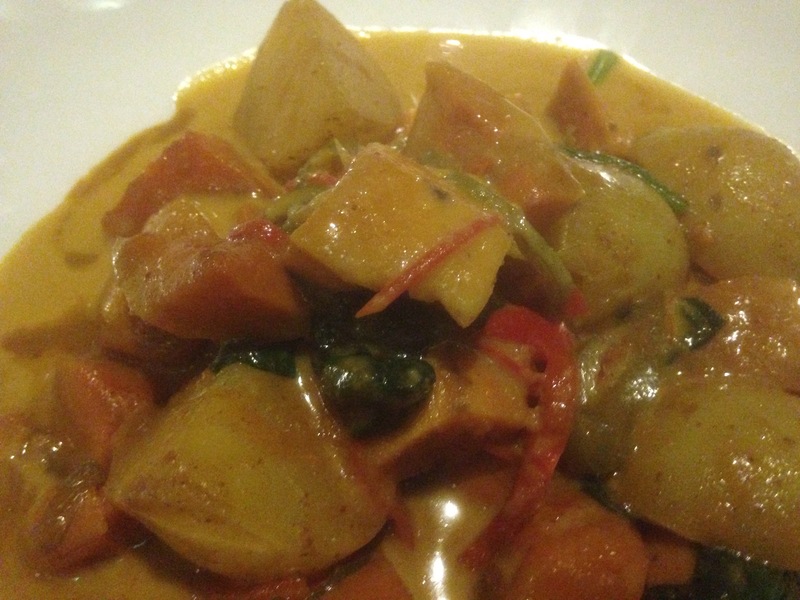 My choice the Gang Ka Ree, yellow curry, was a colourful and vibrant veggie slice of heaven. 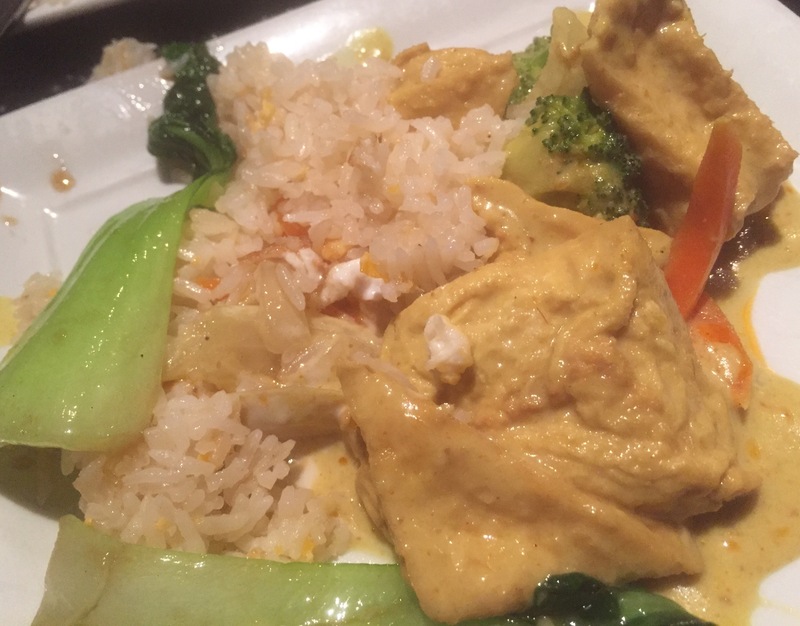 Golden fried Tofu simmered in coconut milk with potatoes, onion, mixed veg in a mild and sweetly spiced yellow curry sauce. It’s a deeply satisfying main course with just the right amount of sweetness from the coconut milk to pronounce the rich creaminess which though milder than some of the dishes packs a punch on many levels with its vegetables and sophisticated delicacy. 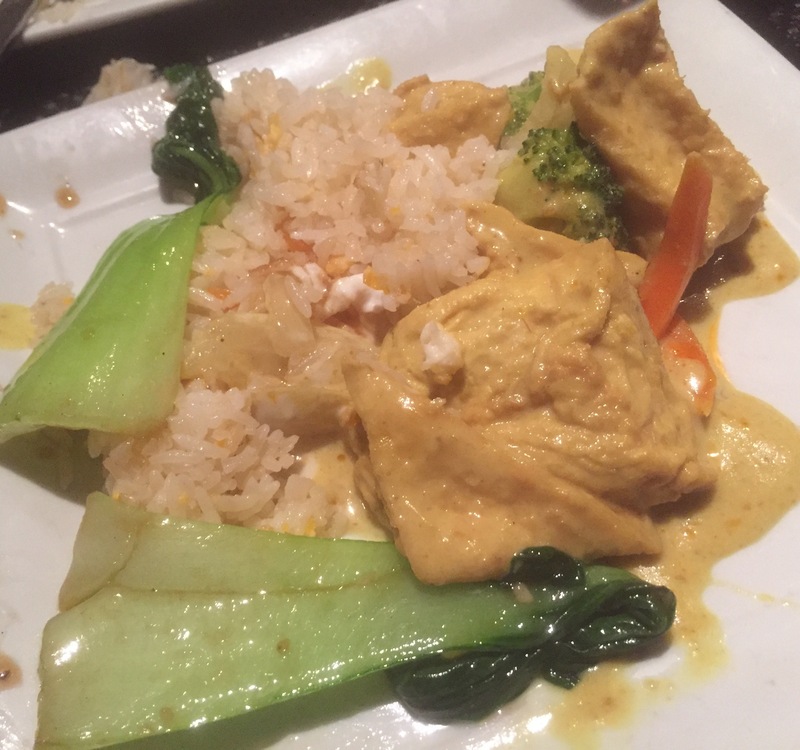 I ate it with Kao Pad Kai (Egg fried Rice) which worked beautifully with the outstanding curry. 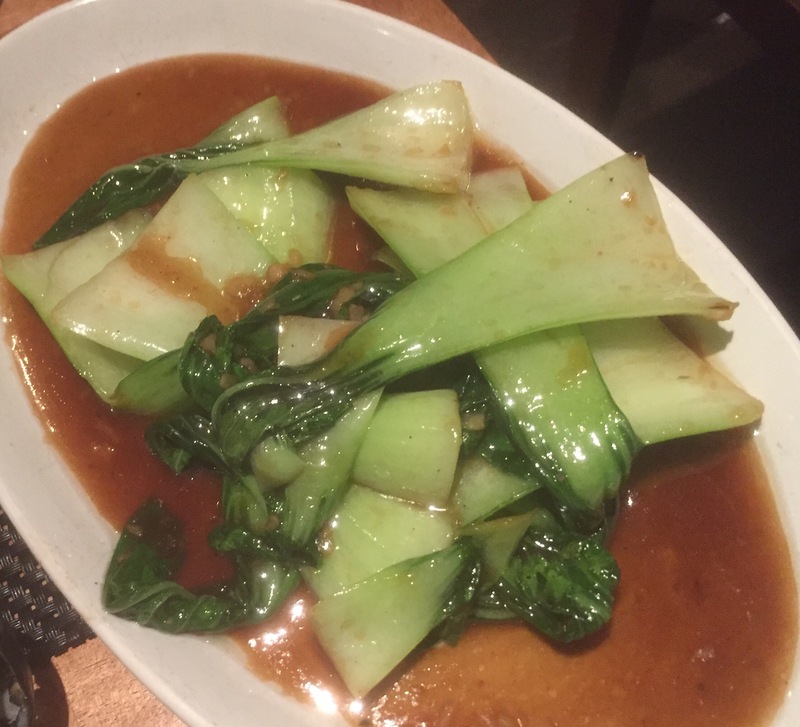 We also shared some delicious Pak Choi in garlic sauce, stir fried perfectly. A joy. 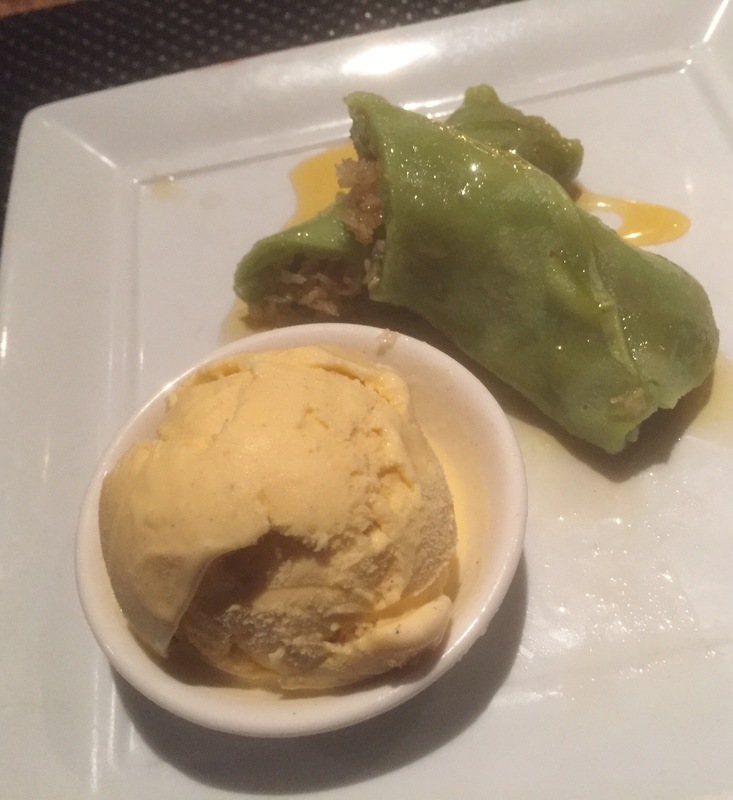 I have found desserts are sometimes hit and miss in Thai restaurants. An after thought, an add on that they feel they must put on the menu because we dictate we need a pudding after the meal in the west. Much like some Indian desserts many are underwhelming. The distinctive green colour of the Pandan leaf makes a vibrant pancake into a satisfying end to the meal. It offers a wonderful subtle flavour to the gentle coconut. Traditionally a breakfast sweet originating from Bali it proves to make a fantastic dessert and well recommended to quench the spicyness of the previous courses. A winner. Pandan leaf pancakes with coconut. Sabai Sabai in Moseley is a lovely restaurant. 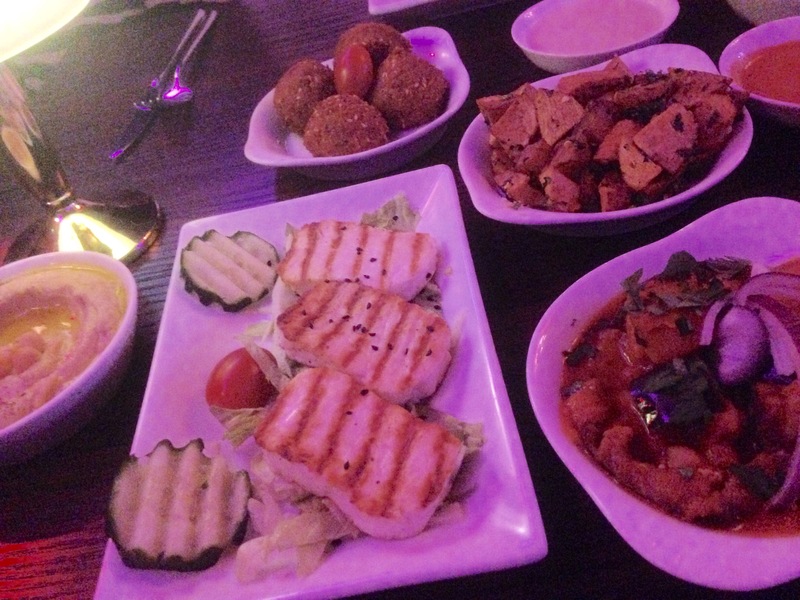 The food is top notch, and with invigorating flavours and a cosy feel it’s a recommended dining choice in Birmingham for Vegetarians. The only critique I can find is that the service can be erratic (not listening, waiting for drinks, a tad rushed) and either very good or a bit noneplused. Though always friendly and at times efficient it’s just best to put up with it as it’s a minor quibble and doesn’t detract from a lovely experience. The Cosyness and intimacy of the venue is an asset and I was pleased the music volume had been lowered (as once it was so loud it was more club like than romantic restaurant). 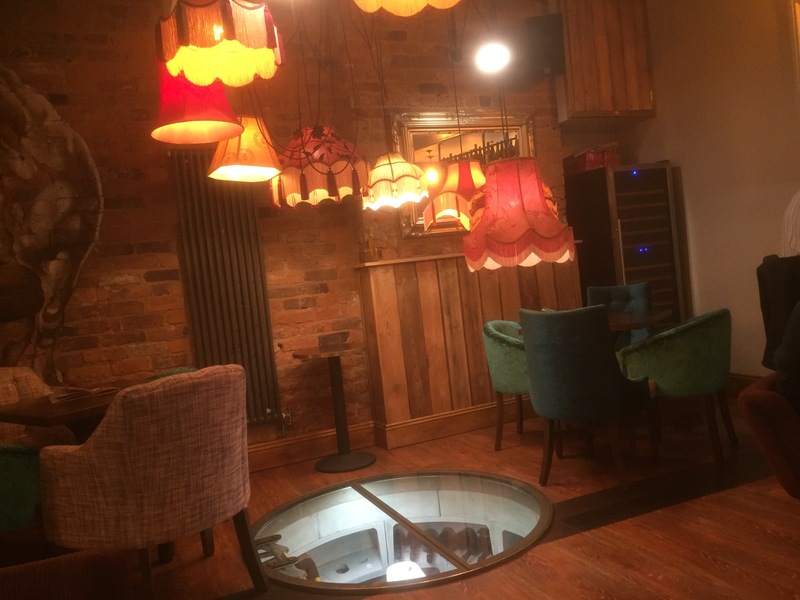 Sabai Sabai in Moseley is one of the most romantic spots to eat in Birmingham and perfect for a date. Just remember though if you are seated in the window to watch out for interruptions, can it be funny? 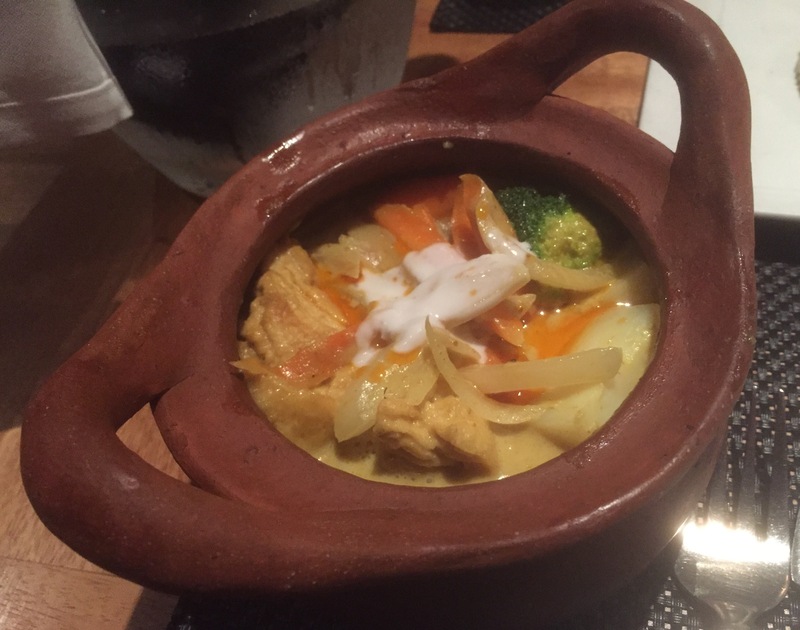 though with Thai food this good who can fail to miss out on this real taste of Thailand. We enjoyed a bottle of Marlborough Sauvignon Blanc with our meal. A good though pricey wine choice at £29.95. We paid for a food and drinks in full and why not I’m happy too. Sabai Sabai Moseley, 25 Woodbridge Road, Birmingham B13 8EH. 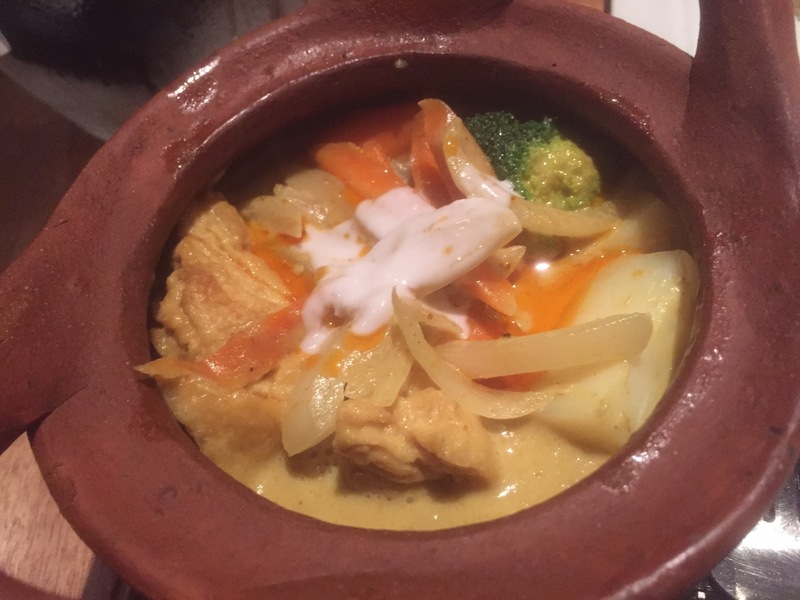 Sabai Sabai is part of The Gastro Card and you can receive 10% off food bill Sunday-Wednesday. Have a glass of top quality wine at the excellent new independent wine bar Cheval Blanc in Moseley Village before dinner. Cocktails also served. 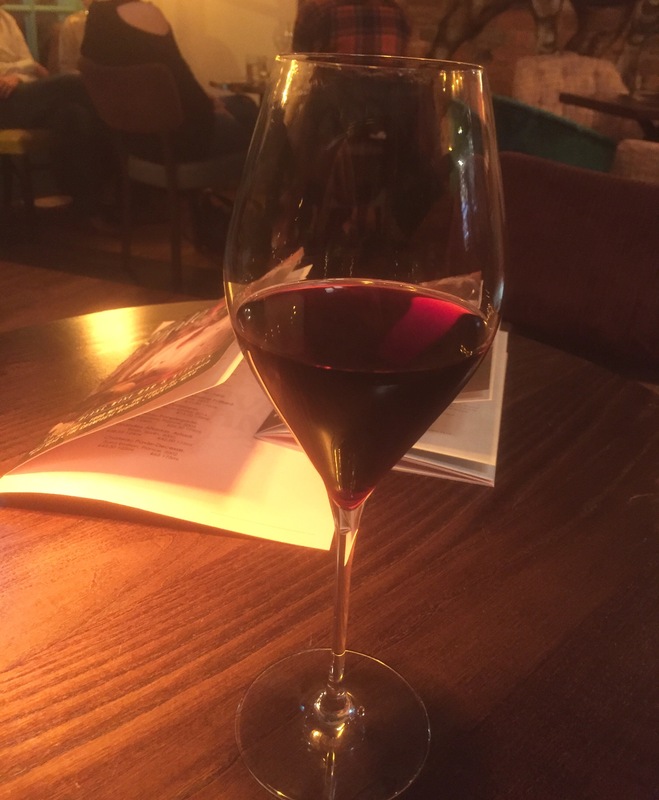 I enjoyed a glass of Red, Le Gourmand Domaine du Janicer from France. Ruth a superb Gin Martini. 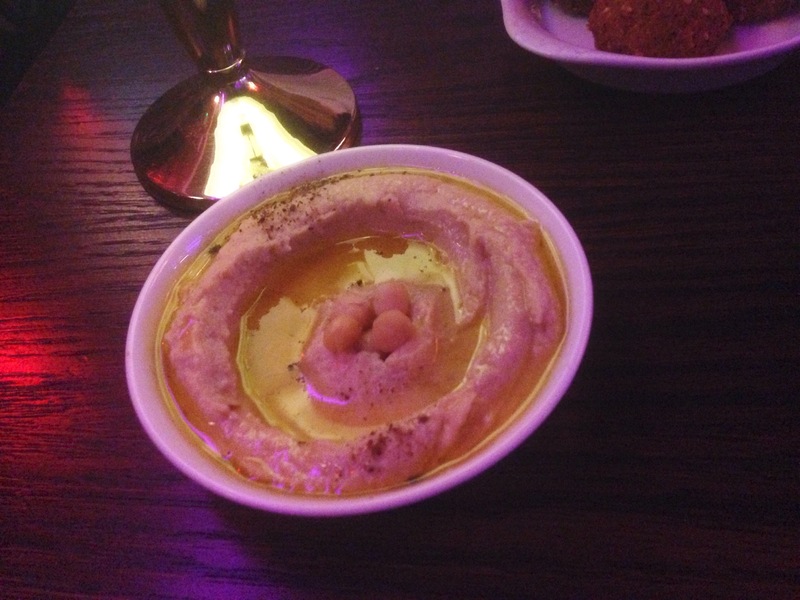 Restaurant review: Mezze at So Mezze and lounge, Birmingham. 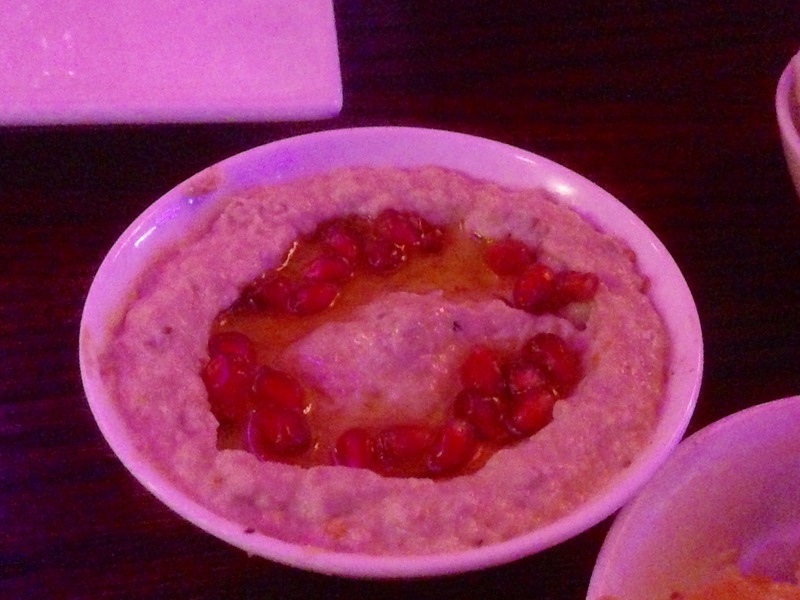 So Mezze is a reassuring place. 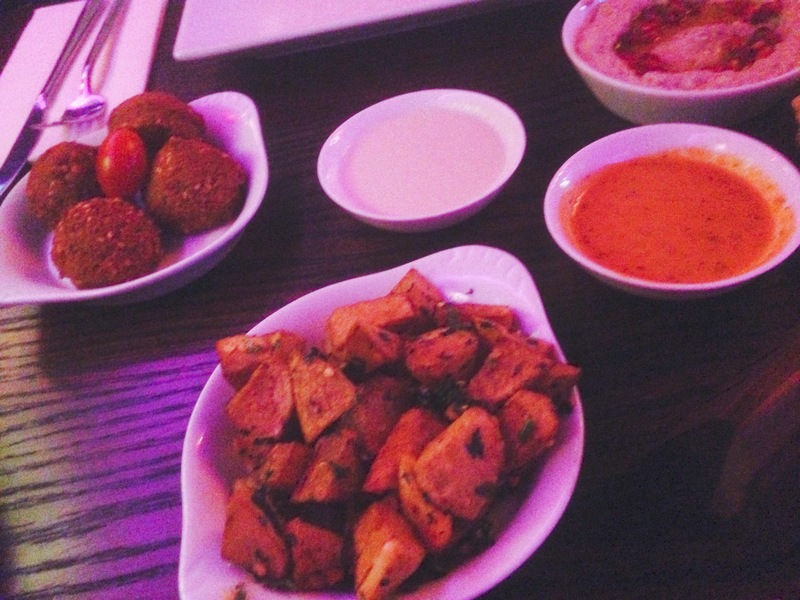 When you look at the menu you are greeted with a long list of Vegetarian dishes that cover All mezze bases and are salavatingly bursting with happiness. You cannot underestimate the comfort this brings and though the proof is in the eating its a positive start. 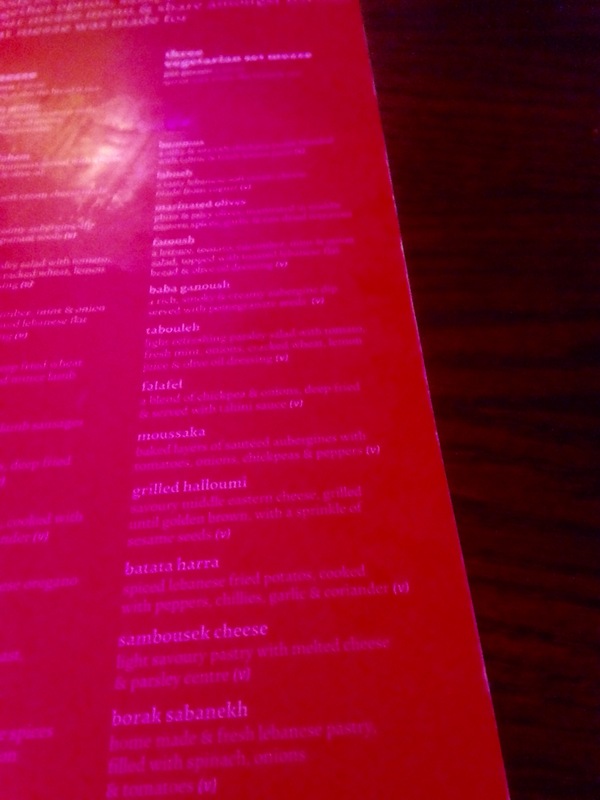 The menu offers a mixture of cold and hot mezze, like tapas small dishes to share and ideal for grazing on with a cocktail from the long cocktail list. 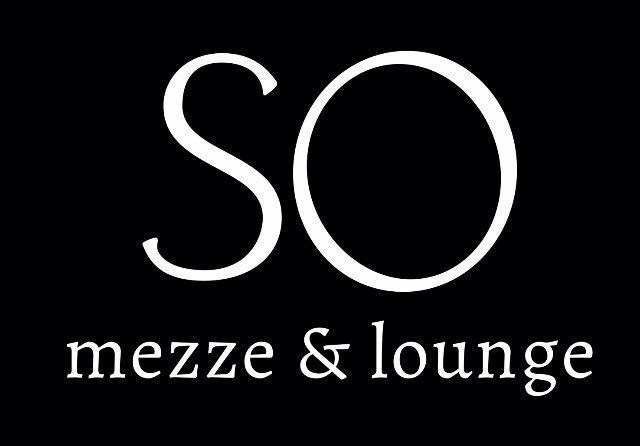 So Mezze serves Lebanese Mezze and is located in Birmingham City Centre in Holloway Head between Broad Street (near the ICC) and the Arcadian provides a lounging experience thats has a calm relaxed Arabesque feel about it and a comfortable cosy arrangement of seating and tables that asks you to linger long into the evening. 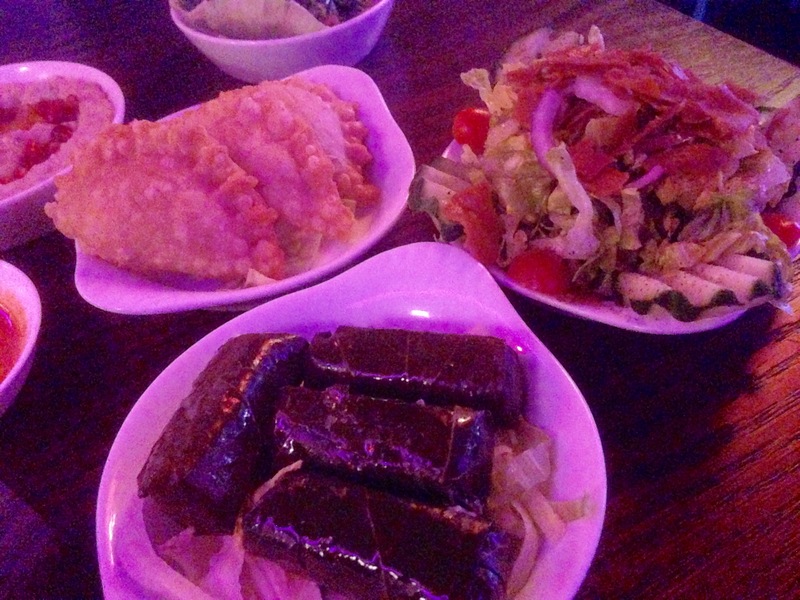 The beautiful thing about Mezze like tapas is its informality. Sharing food is one of my favourite things to do so the long and varied vegetarian menu was perfect for Ruth and I to share, with plenty to satisfy all tastes. We began with a couple of cocktail. Ruth the Dry Gin Martini and myself the Old Cuban. Both excellent with the perfect hit of ingredients. 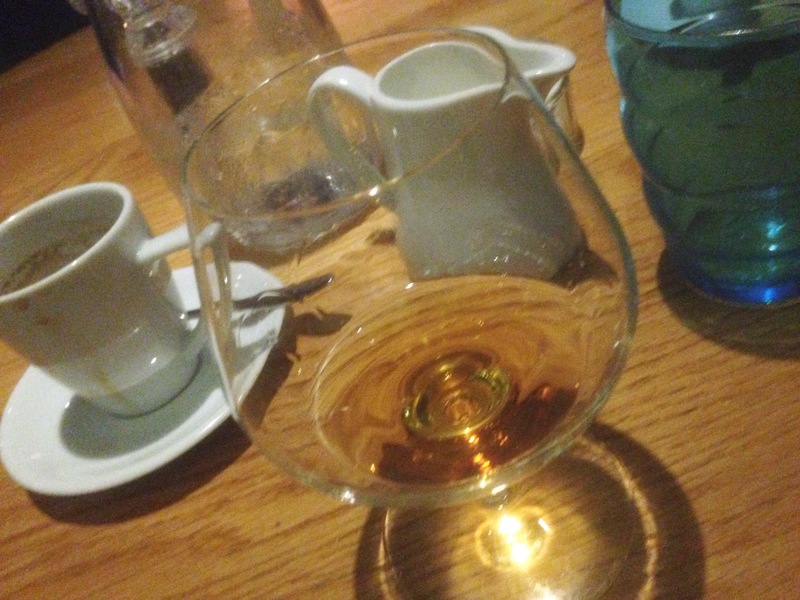 The rum and bourbon in mine, deep and velvety, reassuringly complimenting the informality of the dishes. 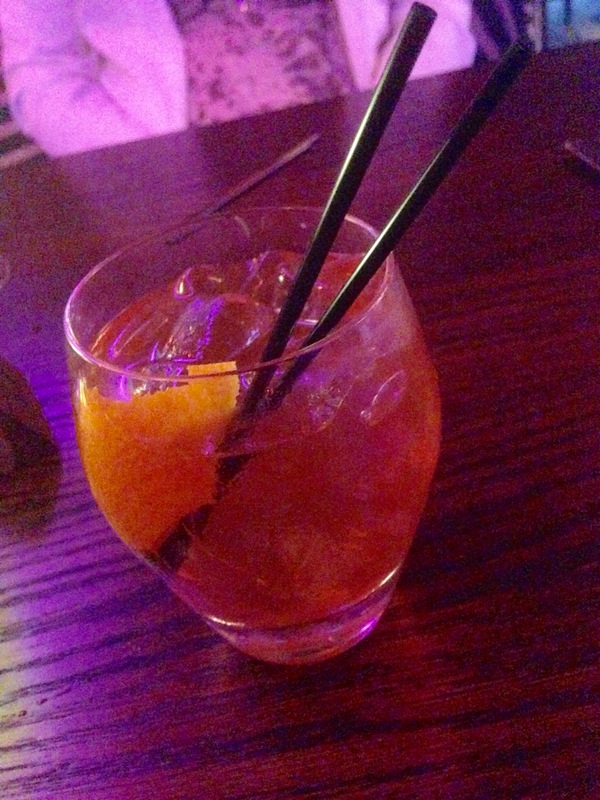 Ruths with the perfect balance of gin and perfectly made. So good we had two more. Superb cocktails. 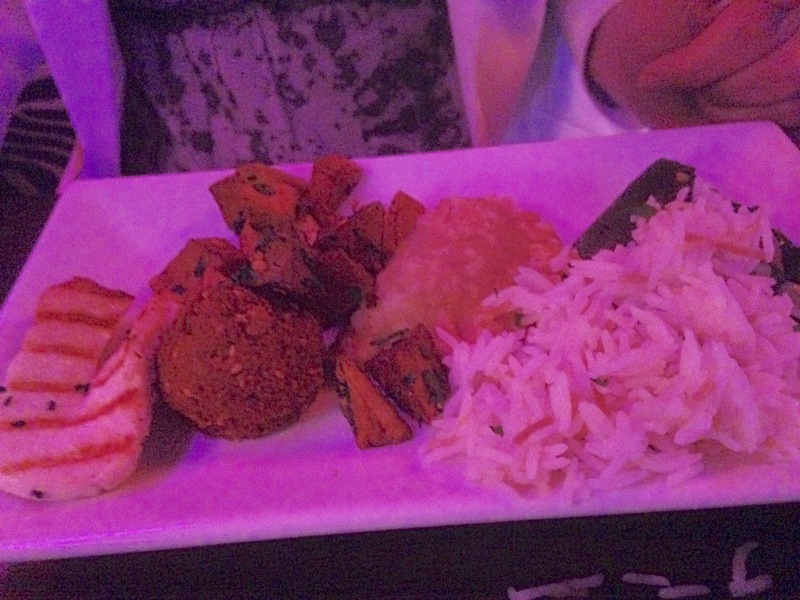 Hot Mezze: Batata Harra, Grilled Halloumi, Sambousek cheese, and Falafal, served with flat bread. 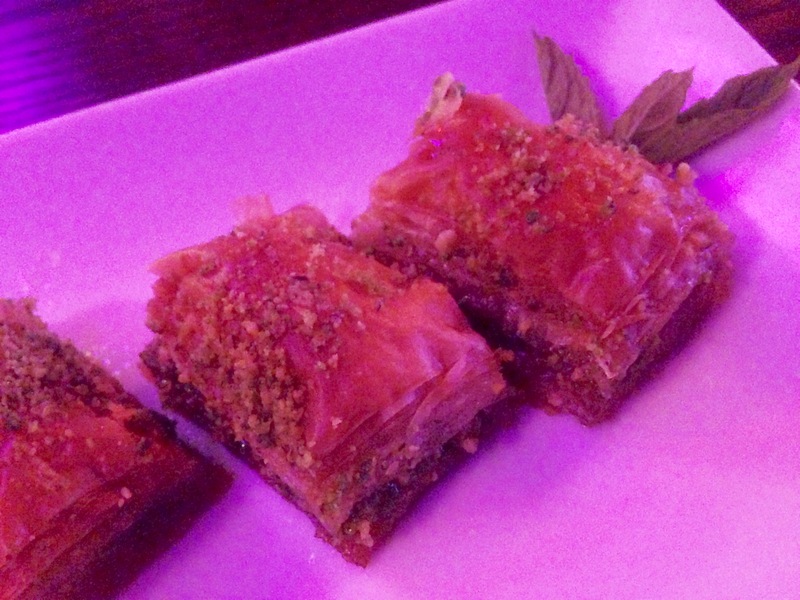 All the dishes were excellent, lovely examples of authenticity and fully enjoyable. Take the cold Mezze dish Baba Ganoush, smoky rich, creamy, the distinct aubergine flavour meltingly good on an excellent flatbread. The Warak Enab, vine leaves stuffed full of rice and spices, morsels of delight and perfect alongside a superbly creamy and silky smooth Humous and light and refreshing Tabouleh with its summery flavours and minty, Parsley soothing hit and the light and breezy Fatoush with its lettuce, tomato, cucumber, mint and onion on flatbread and olive oil dressing. 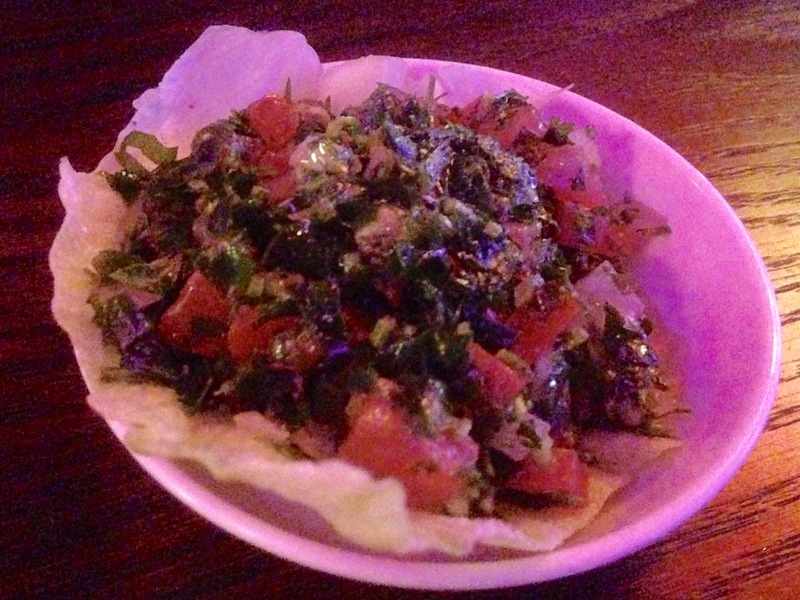 The salads tempered with Middle East herbs are delicious. The hot Mezze were equally indulgent and summery. 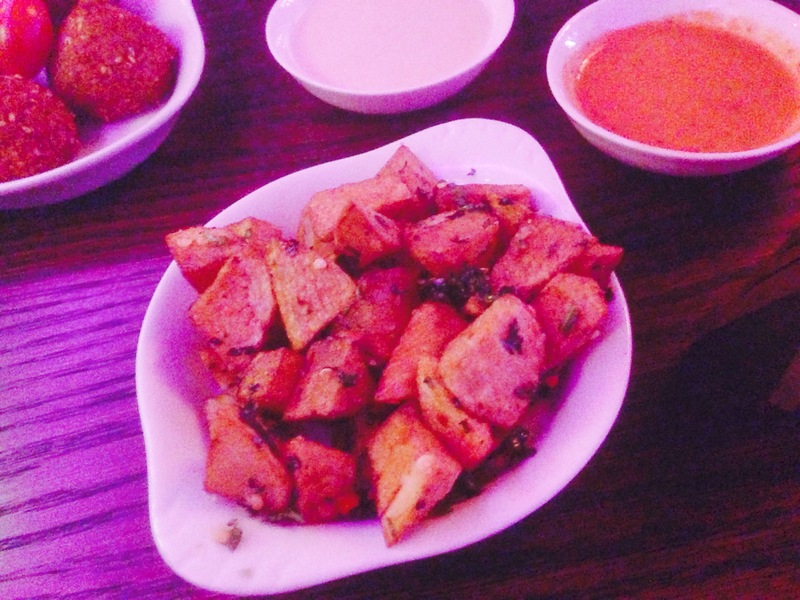 The star dish Batata Harra, spiced Lebanese fried potatoes cooked with peppers, chillies, garlic and Corriander. Small morsels if punchy flavours taken alongside the savoury Grilled Halloumi, with its golden brown savoury touch a delight. 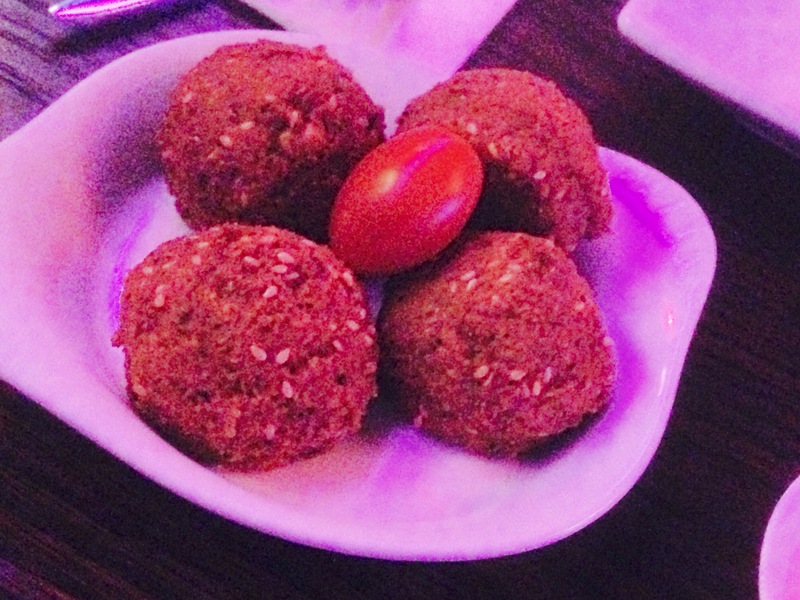 Another dish, the falafel had the perfect weight and flavour. Small balls of chickpeas and onion ( I’m a big fan of chickpeas) deep fried with a tahini sauce. Delicious. The only dish that was not such a winner to me was the Sambousek Cheese, which was a light savoury cheese pastry with feta cheese and parsley which was disappointingly bland compared with the deep savoury flavours of the other hot dishes. Shame. 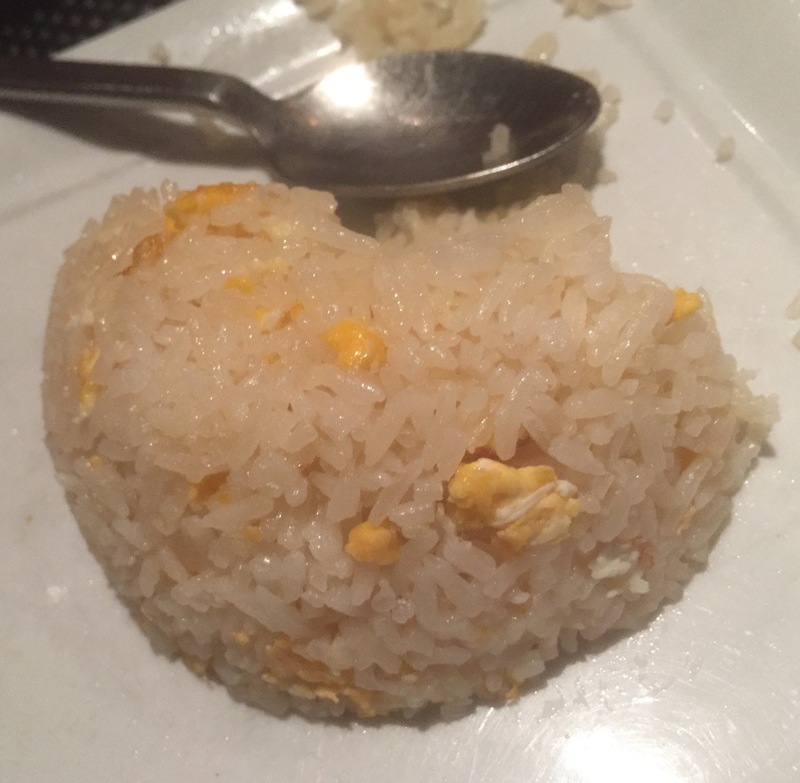 The dishes also came with rice. Veggie menu £20 per person. 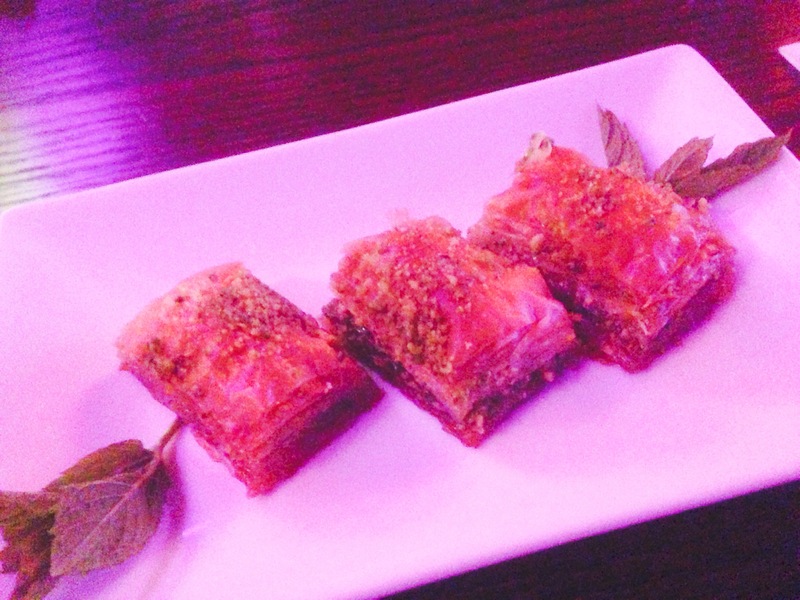 Been quite full we decided to share a beautifully sticky and filling Syrup Drizzled Baklava: soaked layers of pastry and chopped nuts, sticky, syrupy. It’s all in the name, delicious especially with the fresh and refreshing mint tea that we enjoyed with it. 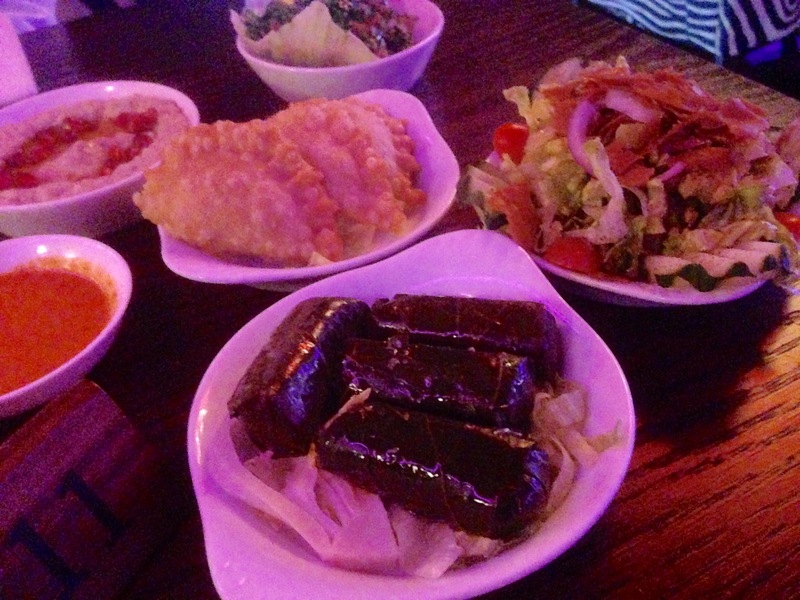 Our meal at So Mezze was a generous meal. For Vegetarians it’s an excellent choice. With plenty of choice, to fill a number of repeated visits. The set menu allows a full journey and the delight in eating food in a shared informal way is perfect for summer or a group party. It has a confidence in itself, unfussy, and enjoyable in its simple charms. They also cater for vegans and Gluten Free diets with notice when booking and reassuringly having so much choice is its key to its enjoyment. All the dishes we tried were excellent and we’d have no hesitation to visit again. A hidden, cool and fun gem in the city centre and perfect for us veggies. 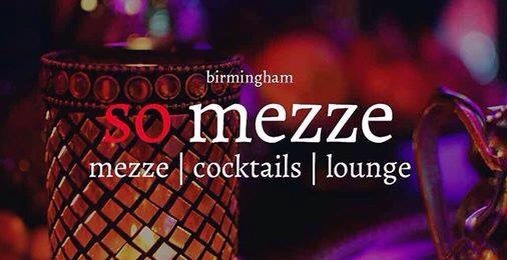 So Mezze, 89 Holloway Head, Birmingham, B1 1QP. 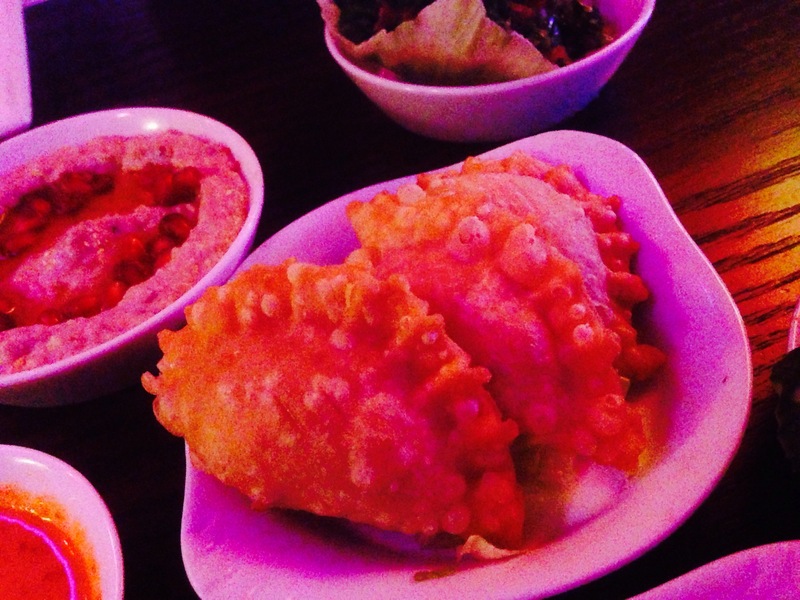 You can receive a discount of 25% with The Gastro Card at So Mezze from Sunday-Thursday. 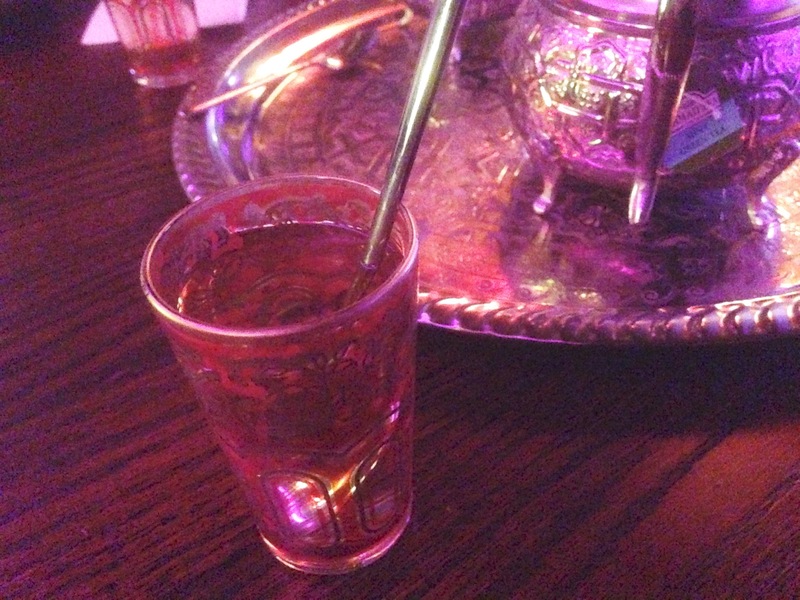 Our meal and drinks were complimentary at So Mezze because of my work for The Gastro Card. All my opinions are honest and my own as always. 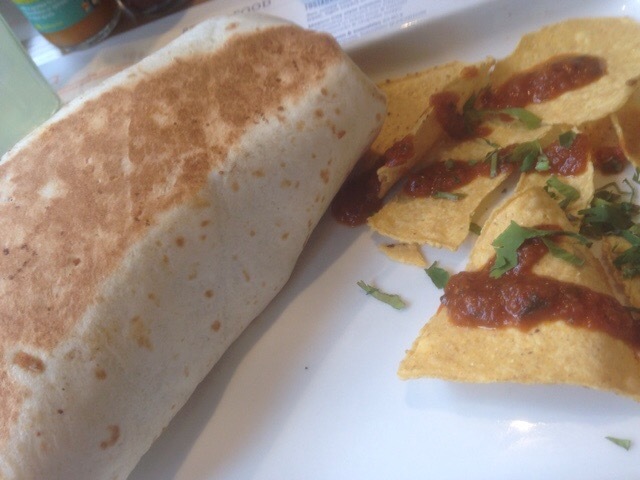 Restaurant Review: Wahaca, Oxford Circus, London. 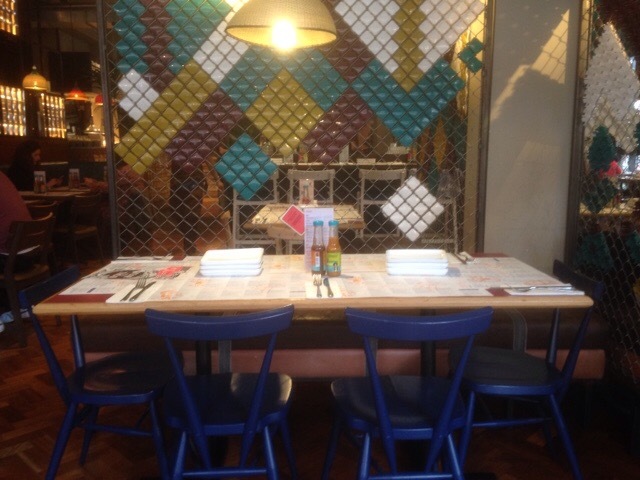 There’s something cosy and comforting about Wahaca that makes you feel relaxed from the moment you walk in. Ruth and I on a recent visit to London decided to feast on some delicious Mexican food, after a full on cultural Royal Academy art visit. Neither of us had been before, though it had been on our list for years, since former Masterchef winner Thomasina Myers started the chain in 2007. From its bright and cheery outside to its light, airy and cheerful riot of Frida Kahlo colour interior, Wahaca shouted out fun and good times. 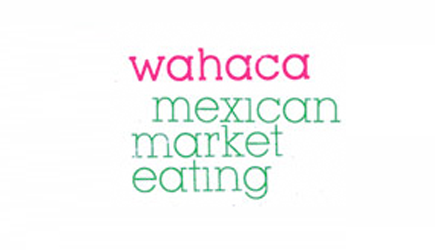 The Mexican style cantina that is Wahaca has sprung up all over London in recent years and then in Liverpool, Manchester, Cardiff, Bristol and Brighton, but sadly no Birmingham yet. Why? So sadly travelling is the name of the game. 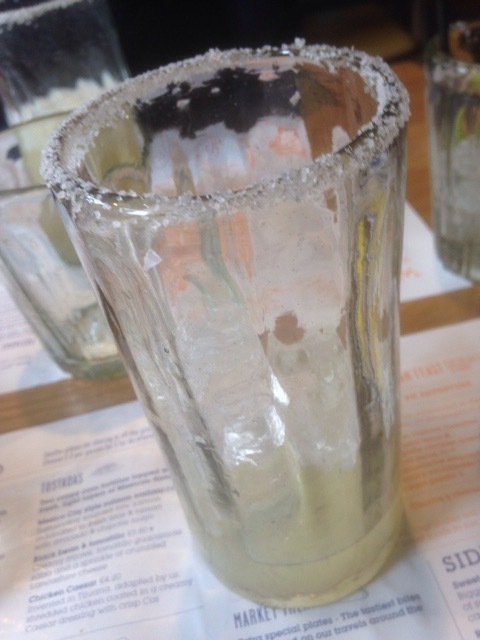 For a lunch time, Wahaca was busy. Through been busy it felt on walking in to be bustling, lively and full of fun. A light filled restaurant comfortable in its own vibrancy. A place to sink your teeth into. It’s hard to resist a Margarita when eating Mexican food. 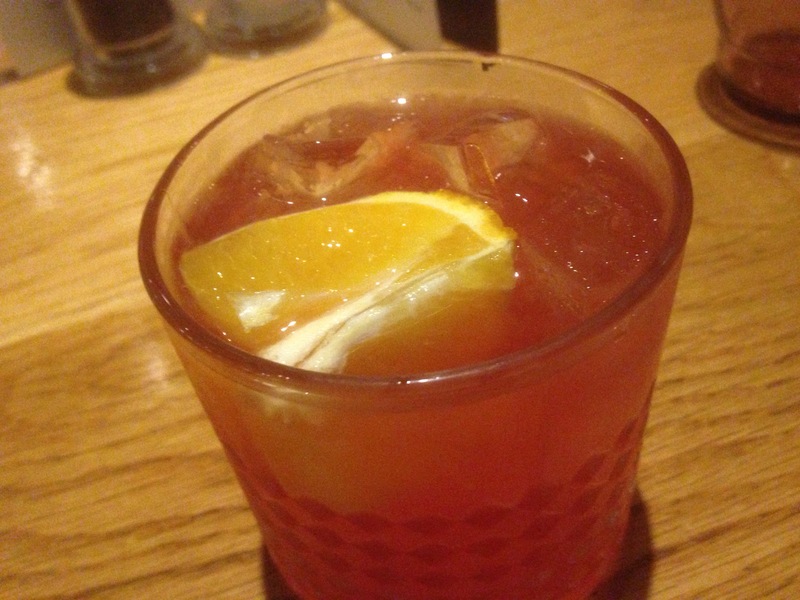 The freshness and zingy nature of the cocktail is refreshing and goes well with the spicyness of the food. 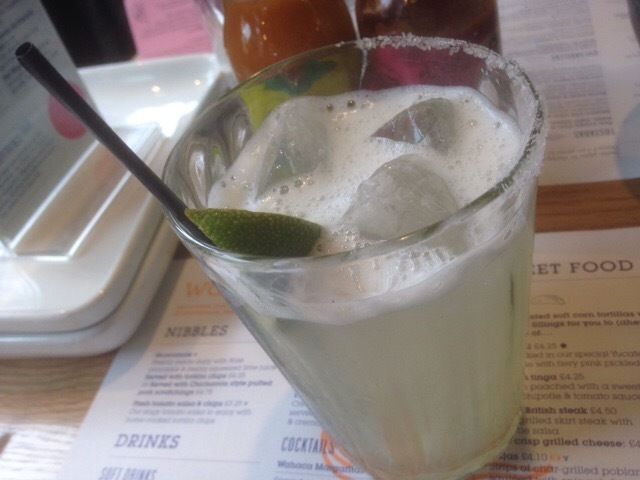 In fact Wahaca’s Margarita’s were superb, on the rocks, sweet and sour, hitting the spot. 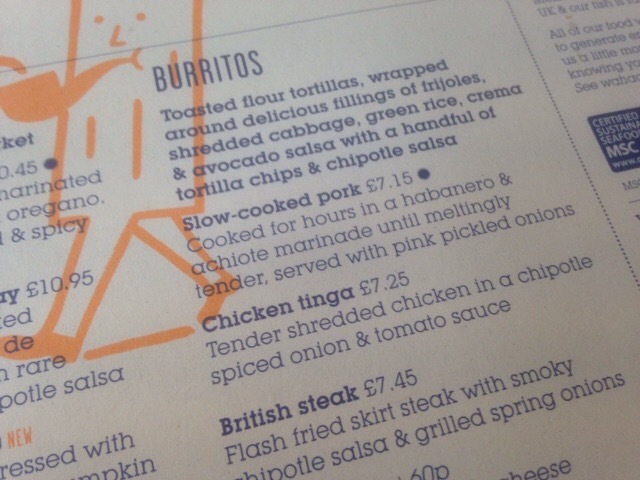 The menu at Wahaca is split into numerous sections. 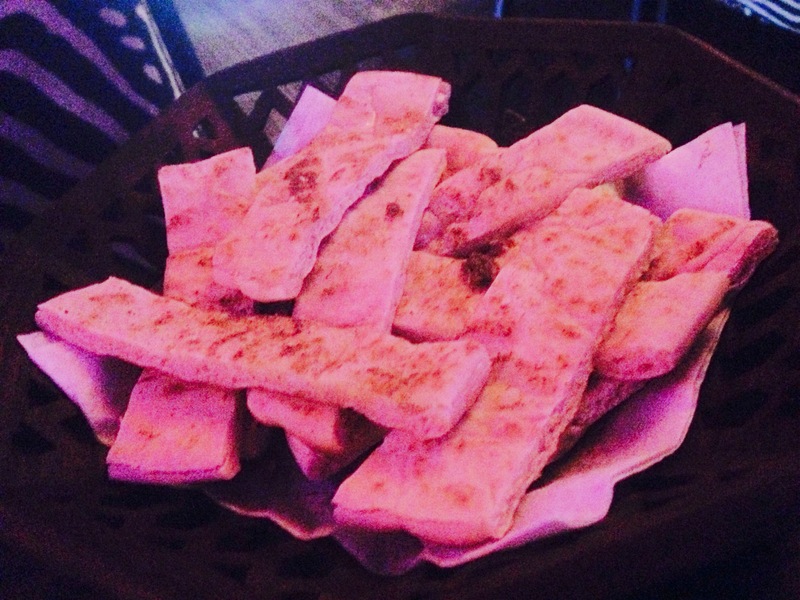 Nibbles, streetfood, tacos, Burritos, sides and then desserts. 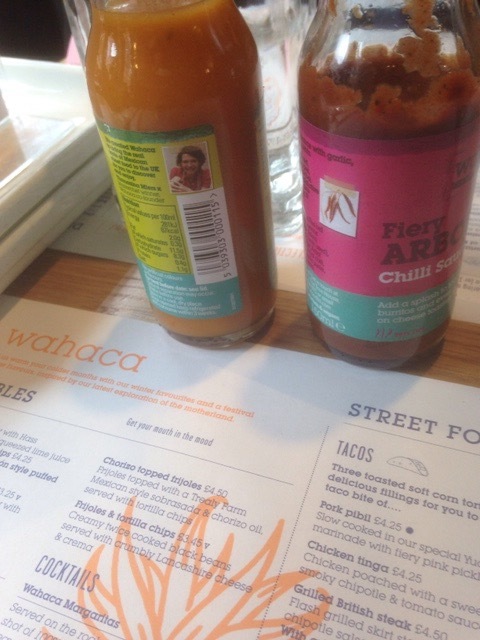 Never be afraid to ask for advice in Wahaca from the staff. They are happy to advice and recommend a dish based on taste and what you fancy. We ordered some nibbles to begin with. 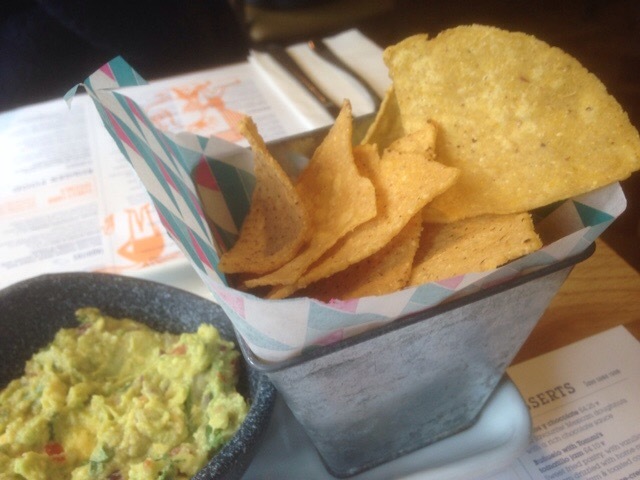 We ordered Guacamole with Tortilla Chips: The Guacamole freshly made, bursting with lime juice and packing a deep punchy Corriander flavour with the ripe and creamy Hass Avocados. Superb. With crisp Tortilla chips, perfect with the Margarita. Deciding not to order from the tapas part of the menu we ordered from the main part of the menu which included Burritos. I ordered the seasonal Sweet Potato Burrito. 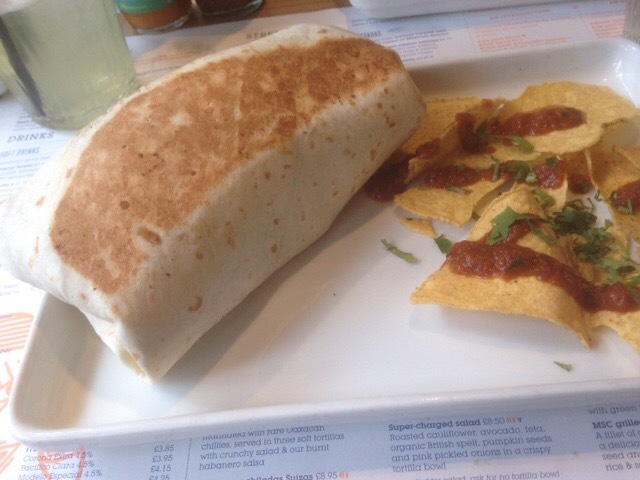 It was a plump, large and savoury burrito. Toasted flour tortillas wrapped around fillings of frijoles, shredded cabbage, green rice, Crema, and avocado salsa. 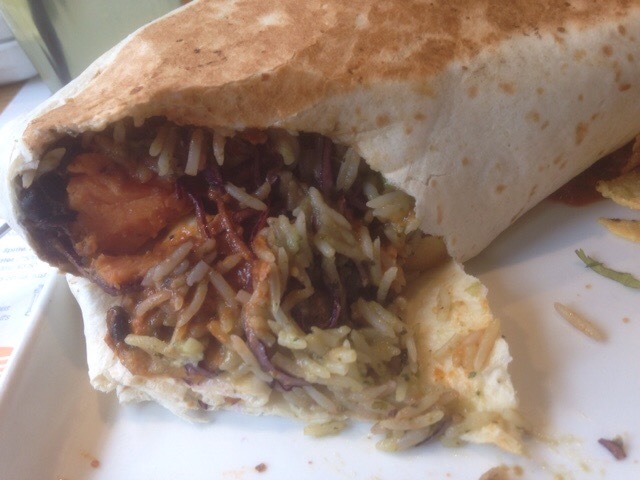 The burrito was full of flavour, with lovely sweet potato notes running through. The potato bulking up the filling and with the lovely frijoles (Refried beans) and the green rice made for a substantial and filling bigger plate that hit my hunger perfectly. The salsa was also nice with a good tomato and garlic chunkyness about it with a good chilli kick. 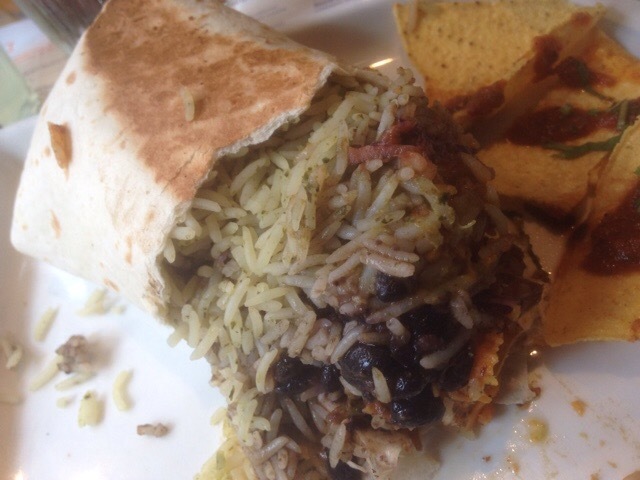 A delicious burrito, perfectly made and full of subtle spicy flavour. 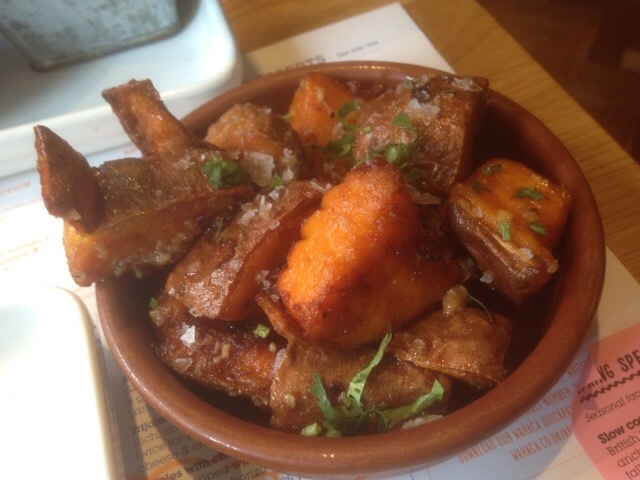 We are our bigger plates with some stunning Sweet Potato side. Chunky and dressed with a superb smoky caramelised mojo de ajo. Heavenly and highly addictive. The nicest I’ve had anywhere. 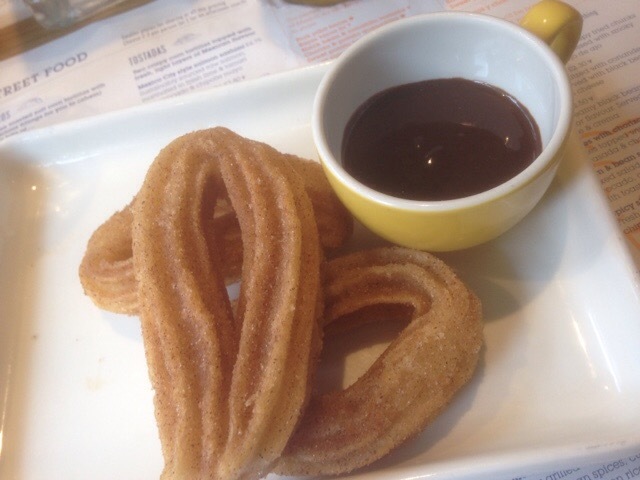 I’m not sure that you can visit Wahaca without trying the Churros y Chocolate. Mexican doughnuts with deep chocolate sauce for dipping. 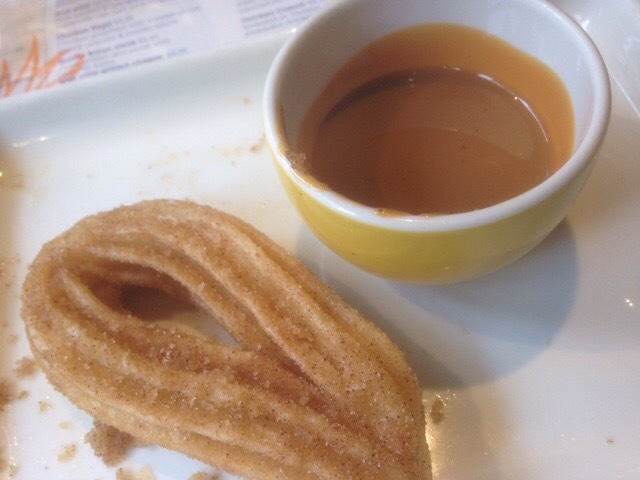 Because we both ordered the Churros our waiter brought us a rich Salted Caramel dipping sauce too. So we shared the two pots. The Churros finished the meal off perfectly. Dusted with cinnamon they had a beautifully light, crisp batter, a dribbly sauce, the chocolate deep and rich, the caramel sweet but salty. 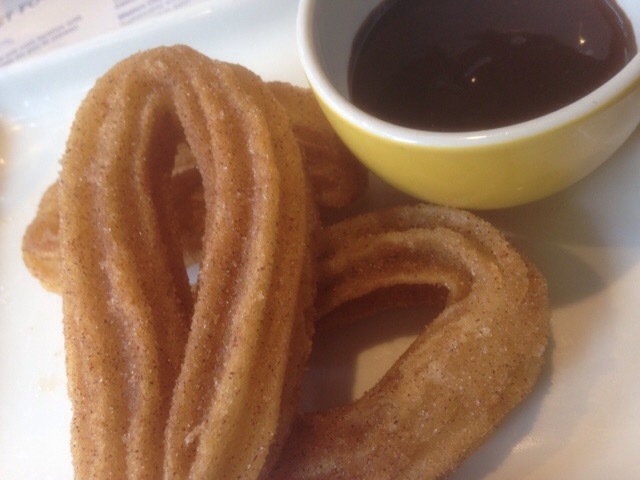 The Wahaca Churros were the best I’ve tried, fresh, soft and fluffy and indulgent. A delicious dessert. 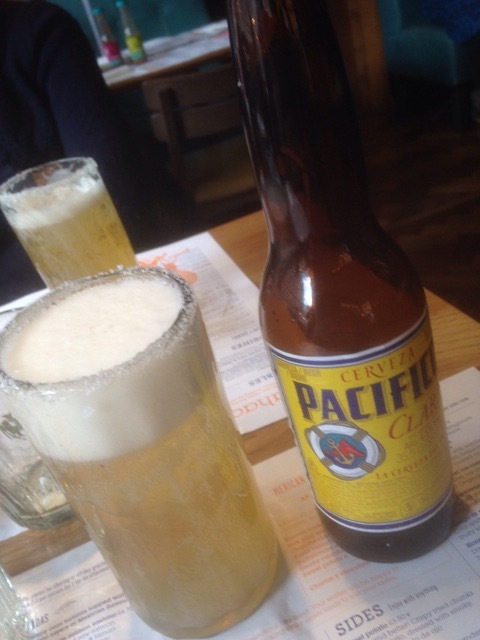 Alongside the Churos we ordered two Pacifico Clara Beers served with a classic Chelada (freshly squeezed lime and salt). Arriba. 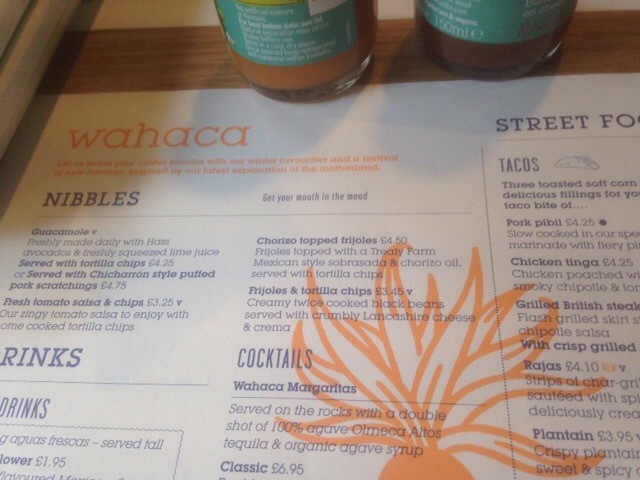 Eating at Wahaca was an excellent experience. 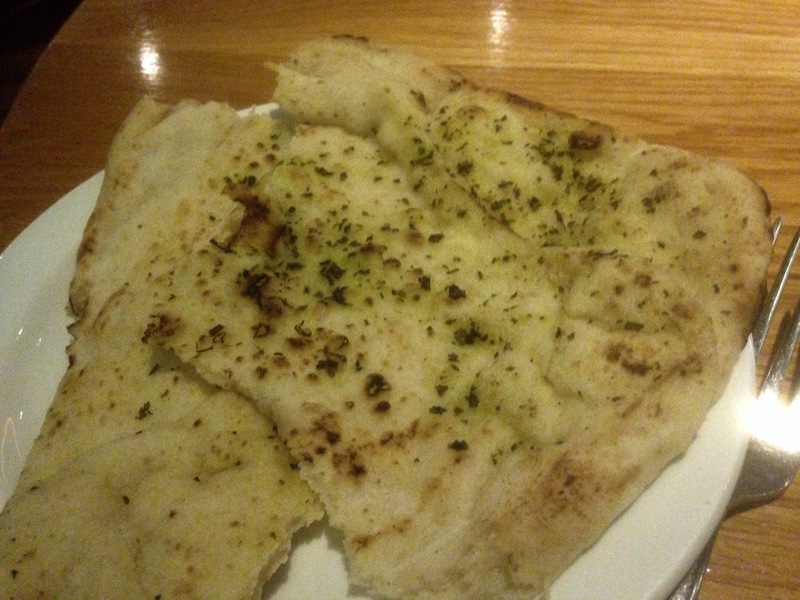 With a wide and varied menu, it has superb options for Vegetarians. Food is the right side of spicy and brilliant for sharing. 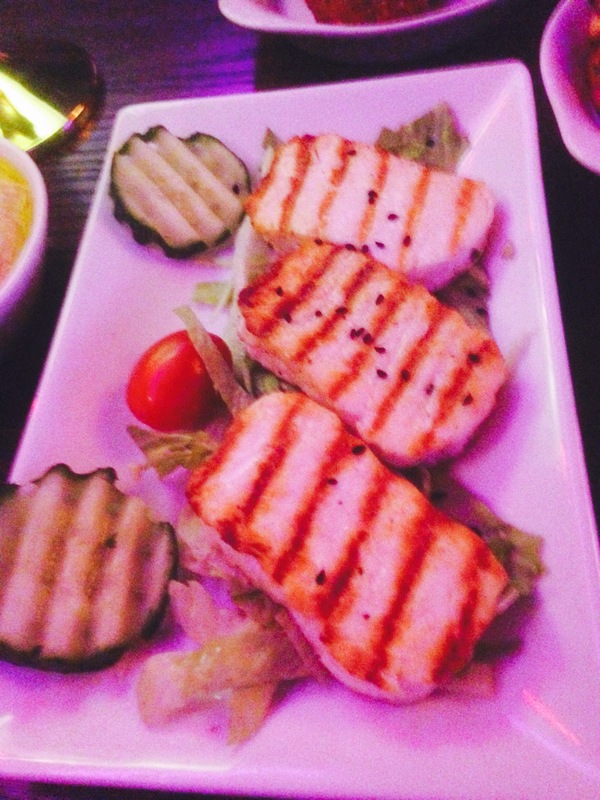 The service is friendly, informed and able to recommend dishes without hesitation. In fact the service makes the meal feel complete, with its genuinity and efficiency. 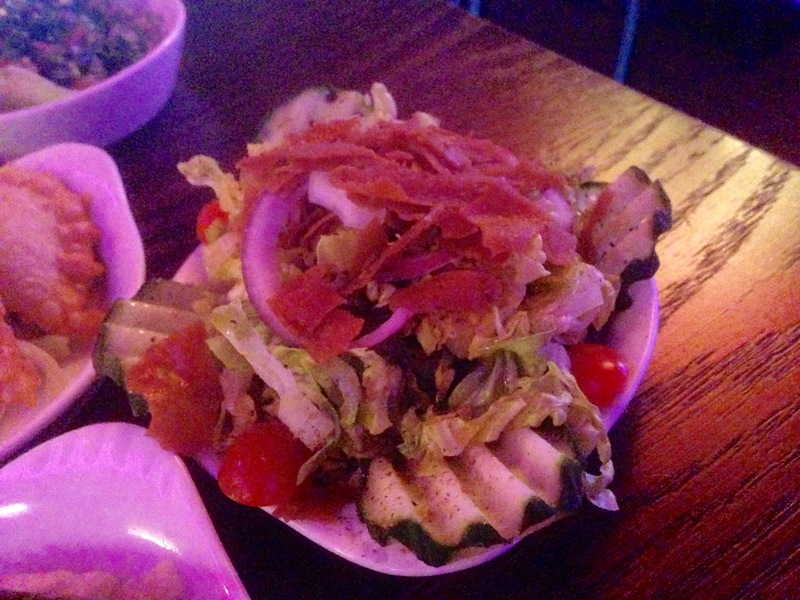 The food feels healthy, fresh and is reasonably priced. 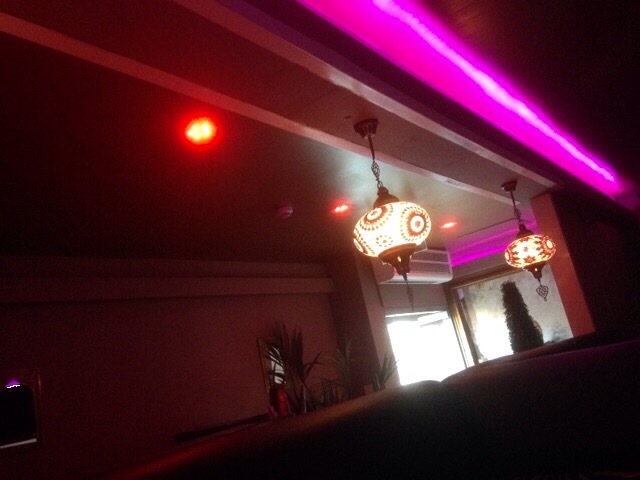 It’s commendably good value and is a fantastic place to eat lunch in a genuinely relaxed and vibrantly lively environment that though cannot be booked in advance is a perfect kick back and chill spot after a full on cultural morning. 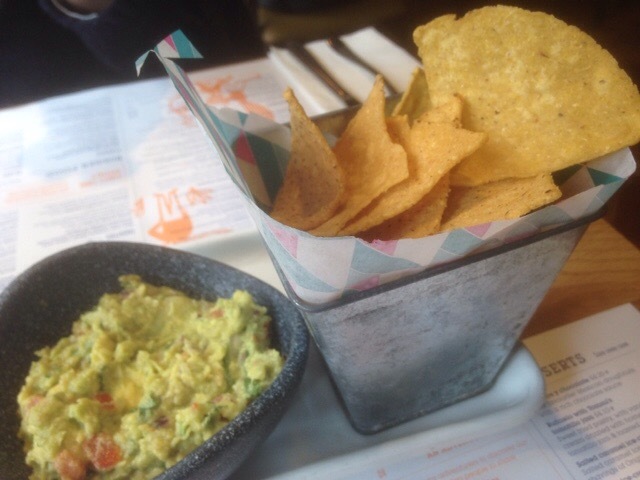 Wahaca is hard to beat for tasty, colourful Mexican food and though not groundbreaking is a real winner. It feels independent though isn’t and is highly recommended on any visit to London, Vegetarian or not. Chelada in the base of the glass. Disclosure: We paid for our meal and drinks in full. All opinions are my own and honest as always. 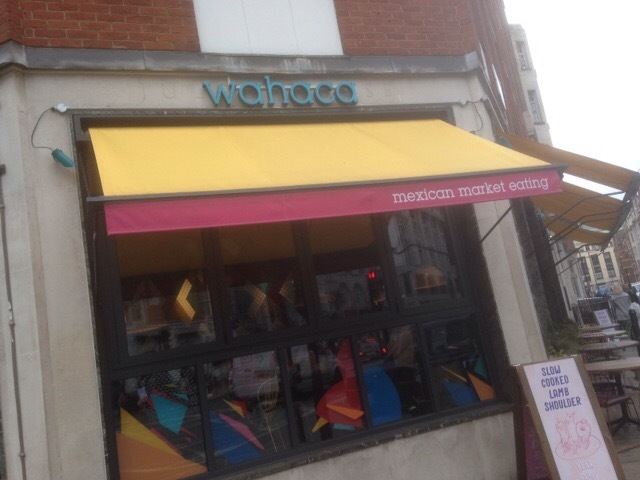 Wahaca, Oxford Circus, 26-28 Great Portland Street, London, W1A 8QT. Near Oxford Street. Rofuto brings Birmingham Dining to new heights this April. I’ve been walking past the new Park Regis Hotel at Five Ways in Birmingham quite frequently and have seen it develop and fill the vacant space that sits next to the shops on the roundabout. It looks impressive, offering another landmark on the city skyline. At a cost of £50 Million, the development is due to open on the 29th March. With 253 bedrooms, two Junior Suites and the largest Presidential suite in the city, it’s set to become a destination for leasure and business. Inside as well as as the hotel a bar and two restaurants and ‘Shakina’ Urban Dry Spa will be on offer to hotel visitors and the public. Renowned restaurateur, Des McDonald is set to shake up the Birmingham dining scene with his latest venture Rofuto, ( opening on the 22nd April) a restaurant set high in the City skyline at over 141 feet in the sky with incredible 360 degree views. 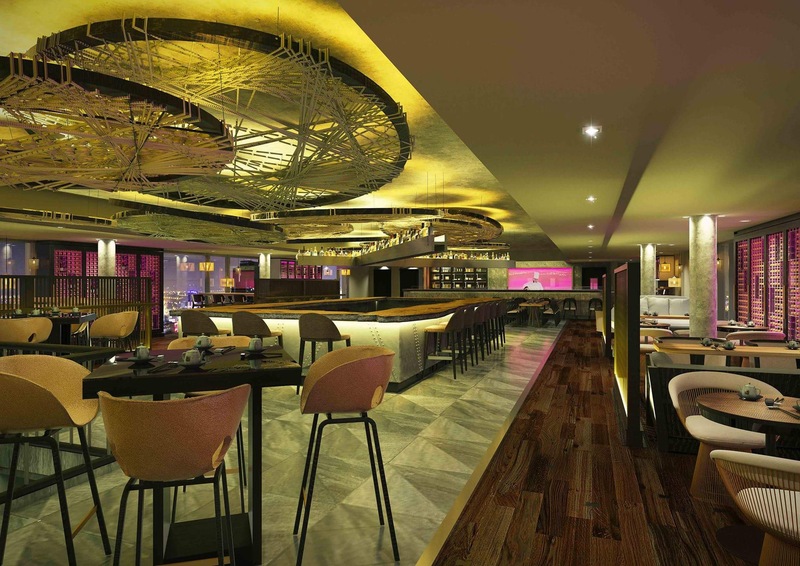 Opening on 26th April with a £3 million investment, Rofuto will offer an izakaya-style restaurant, serving a high quality modern Japanese menu of world class dishes. The restaurant will sit alongside the stunning cocktail lounge and sake bar, Kurabu, from its unique rooftop position at the new Park Regis Hotel. Located high above the City centre, the restaurant and cocktail lounge sits on the 16th floor of Park Regis, the new 4 four star modern luxury hotel located in the heart of Birmingham, Rofuto is a direct translation of the word ‘loft’ in Japanese and the interiors reflect this inspiration. With a large central bar, an open Japanese style kitchen and an eclectic mix of furnishings, unique hand painted murals and design, Rofuto is a truly theatrical dining space. Kurabu, with its panoramic views of the city skyline, world class DJs and a backlit bar is perfect for more intimate drinking and dining. The vision for the restaurant and cocktail lounge has been created by one of the UK’s most respected restaurateurs, Des McDonald. With over 20 years’ experience running some of the world’s most high profile establishments including Le Caprice, Scott’s, Soho House and Annabel’s. Early in his career, Des was Head Chef at the world famous Ivy restaurant, before moving from the kitchen into the boardroom to become CEO of Caprice Holdings. Des was inspired to open Rofuto following visits to Tokyo and Singapore; he has developed every aspect of the concept, design and menu to bring a new izakaya-style restaurant to Birmingham’s thriving dining scene. Rofuto will be open for lunch and dinner on Tuesday to Saturday and Sunday for lunch. 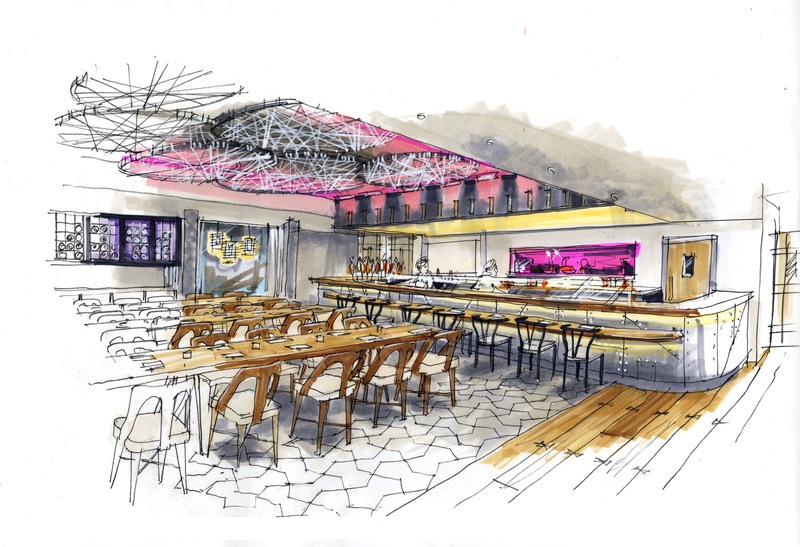 The restaurant will serve modern Japanese cuisine, made using world-class fresh ingredients, from traditional sushi to yakitori from the grill. The menu is divided into six sections: Sushi and Sashimi, Tempura, Robata Grill, Mains, Sides and Desserts. Rofuto also cater well for Vegetarians. Vegetarian futomaki; cucumber and roasted sesame hosomaki; okra hosomaki. Starters- Sesame, Spinach with Cassava crisps. Tempura- Goma tare tempura aubergine and fig. Robuto Grill- Asparagus yakitori with butter soy. Mains: Japanese Wild Mushroom Congee, Crispy Tofu and Parsley Chlorophyll. Signature dishes on the main menu include Foie gras nashi pear gunkan Chinese truffle; Confit duck and raspberry sunomono; Saffron gindara with razor clams, Chinese sausage, kohlrabi puree and sea herbs; Sesame tuna tataki and soft shell crab with wasabi puree and black garlic crumble and Miyazaki Wagyu beef served with gobo crisps, avocado puree, garlic ponzu and truffle salt. Desserts feature twists on European classics such as Matcha tiramisu and wasabi macaroon and Cardamom and coconut panna cotta with passion fruit. Rofuto opens on the 22nd April. Kurabu Cocktail lounge will offer an array of wines, beers and soft drinks, along with a bespoke cocktail list and unique sake offering to perfectly compliment the Japanese cuisine. Fresh Sake from Takashimizu Brewery in Northern Japan will be on offer, alongside Koshua aged Sake from Shiraki Brewery in central Japan. Rofuto will also offer ten Japanese Whisky’s which I’m very keen to try. The cocktail list includes highlights such as the Red Lotus which combines Shochu, Tequila, Cranberry and Lychee Sorbet and Kietsu which is an exotic combination of infused Raspberry Sake, Passionfruit liqueur, Apple and Pineapple. Rofuto’s wine showcases some more unusual varieties such as Pecorino, Gewurtztraminer and Pinot Blanc in the whites and a particular focus on low alcohol, low tannin reds. The restaurant’s interior, designed by Tibbatts Abel (Interior Designer for Jinjuu Soho and Buddah Bar) is a fusion of urban, industrial and warehouse design inspiration alongside a fun and vibrant cocktail lounge style. Warm rustic timber is used throughout, with industrial tones and a palette of neutrals, warm taupe’s, greys and blacks. 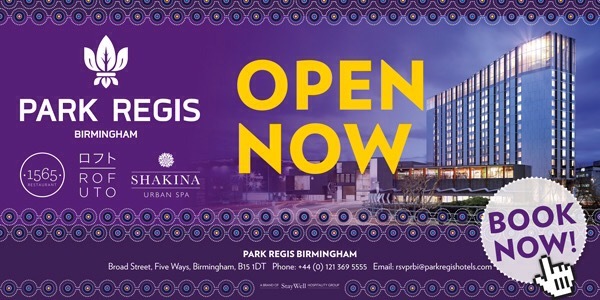 Park Regis Birmingham opened on Tuesday 29th March 2016 and boasts 253 deluxe bedrooms, two junior suites, the largest presidential suite in the city, an executive level complete with conference and meeting space, and a business lounge with executive check-in facilities. 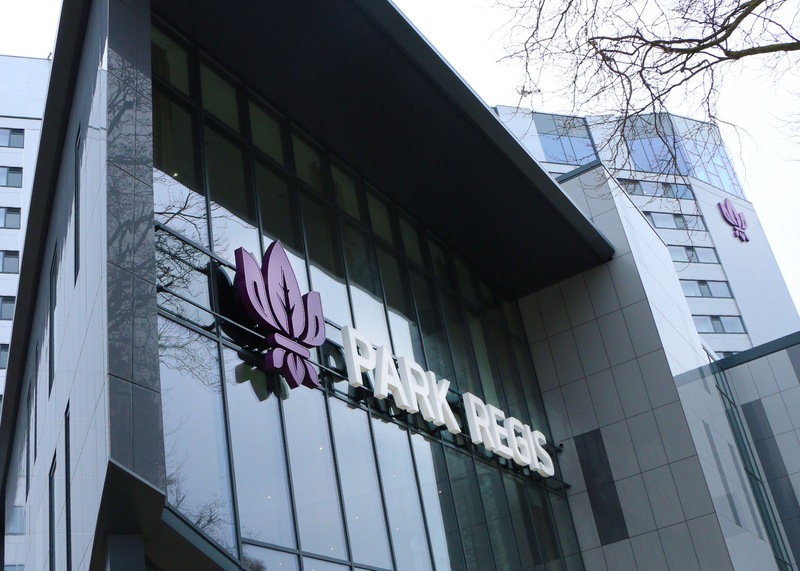 The £50 million hotel is the brand’s first Park Regis in Europe and has created over 200 jobs for the region. Rofuto Should be a super addition to Birmingham’s evolving dining scene and should offer something different, once again. I’m looking forward to giving it a try. 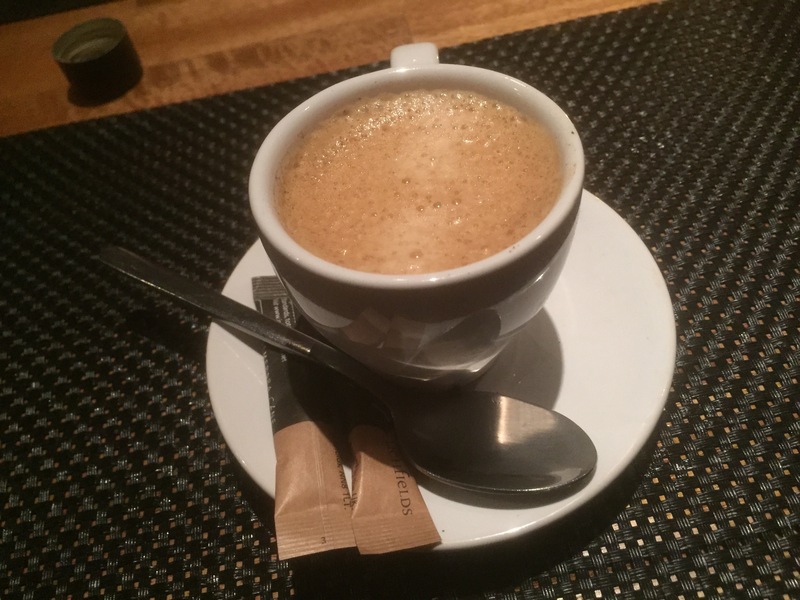 Rofuto, Park Regis Hotel, 158 Broad Street, Birmingham, B15 1DT. All photos and images from Rofuto. The second restaurant is called ‘1565’ and will feature signature dishes, grills and classics. I’m unsure as yet on the veggie options. It will also house one of the largest outdoor terraces in the city. 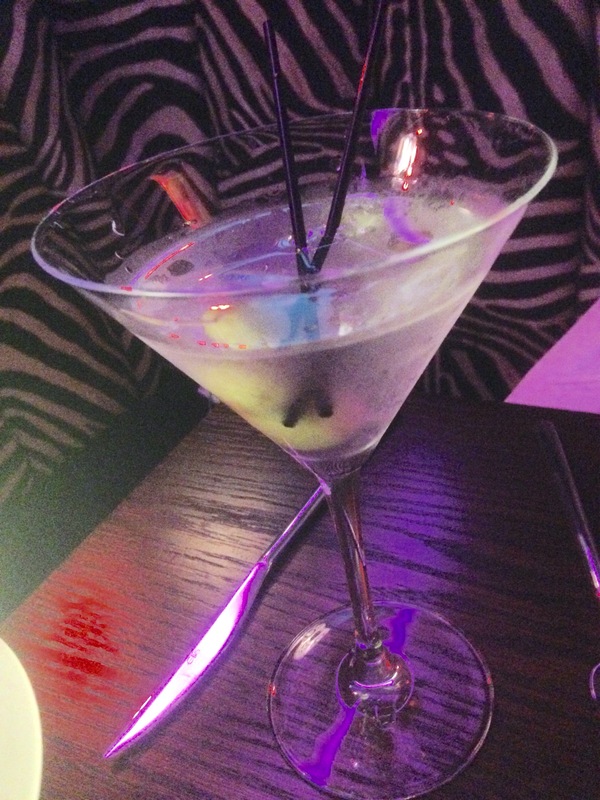 Restaurant Review: #VeggieMonth, Met Bar & Kitchen, Solihull. 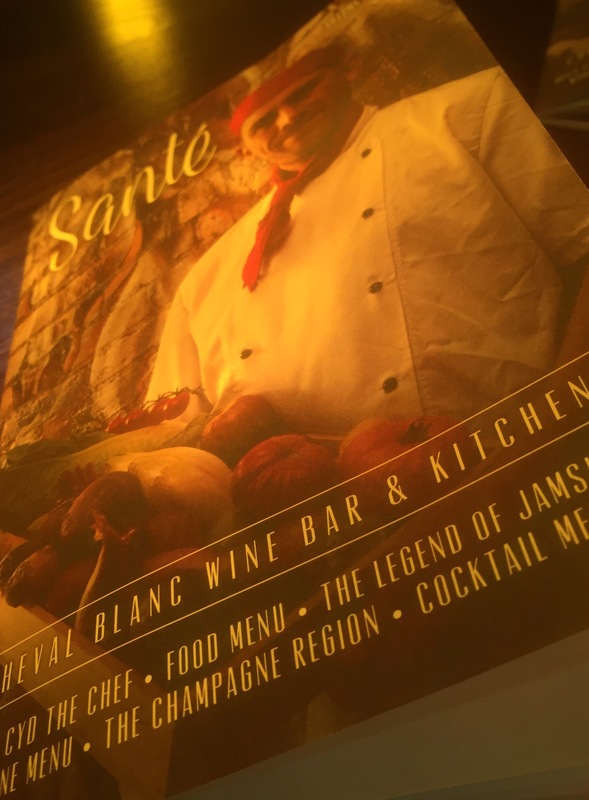 How refreshing is it to find an independent restaurant and bar in Solihull town centre. 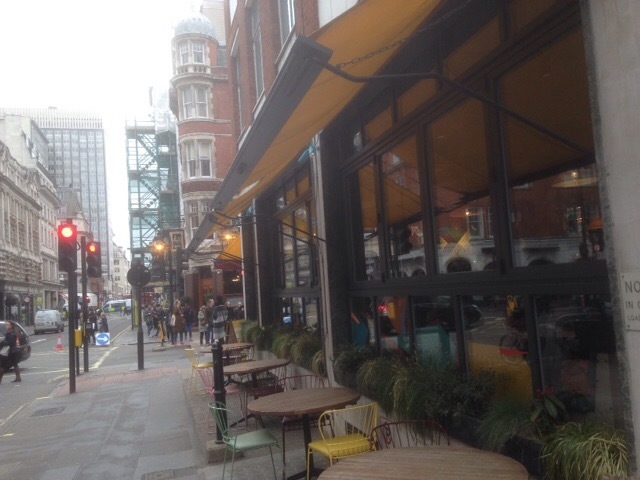 Amongst the same again chains and cheap and cheerful Broad Street like drink offers sits the Met Bar & Kitchen. 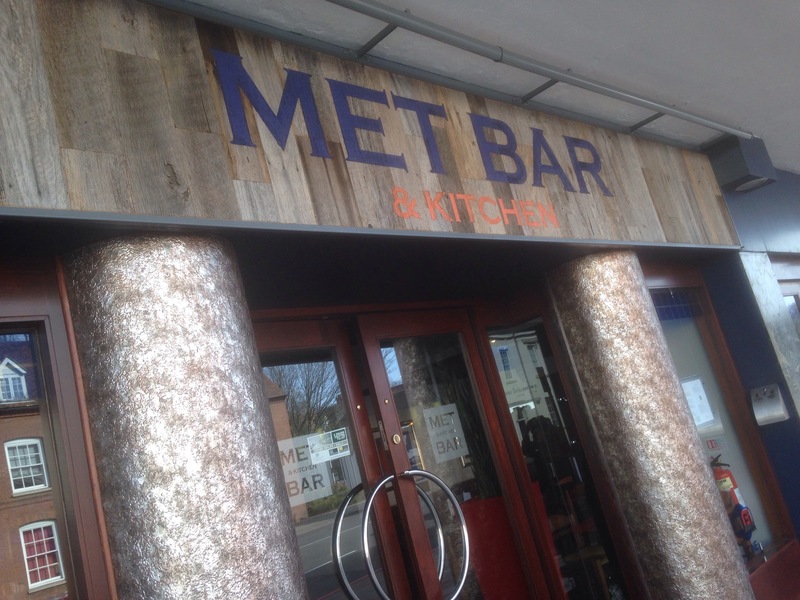 The Met Bar & Kitchen is located in the centre of Solihull close to Mell Square & Touchwood. 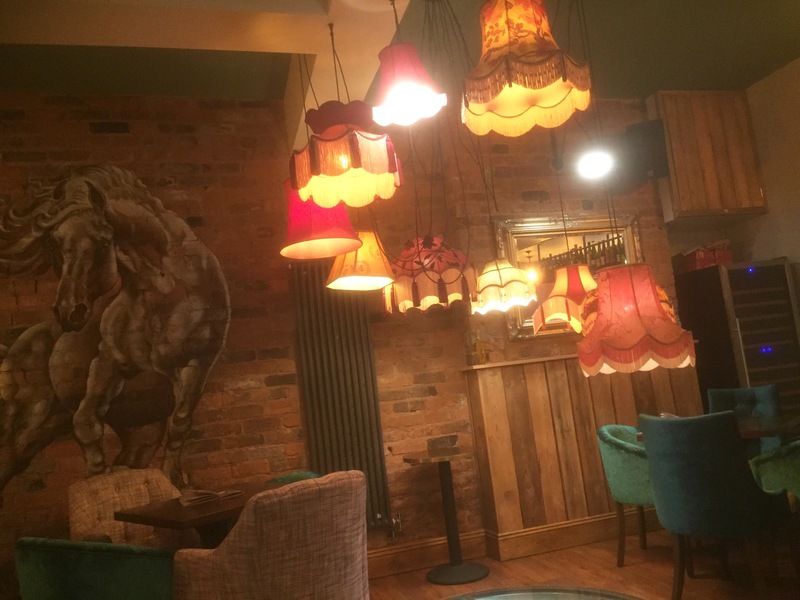 It’s an independent all day bar and restaurant that offers something different in Solihull Town Centre to the dominant chains that are nearby. Inside It has a modern decor with some urban touches, that keeps these thankfully to a minimum and has a cosy and relaxed ambience that has a buzzy touch on the Friday night Ruth and I visited. With a well stocked bar of local ales, craft beer, cocktails, bubbly and a good and reasonably priced wine list it appeared a good bet for a relaxed but serious drink on a weekend without the loud music and teeny vibe of other venues locally. 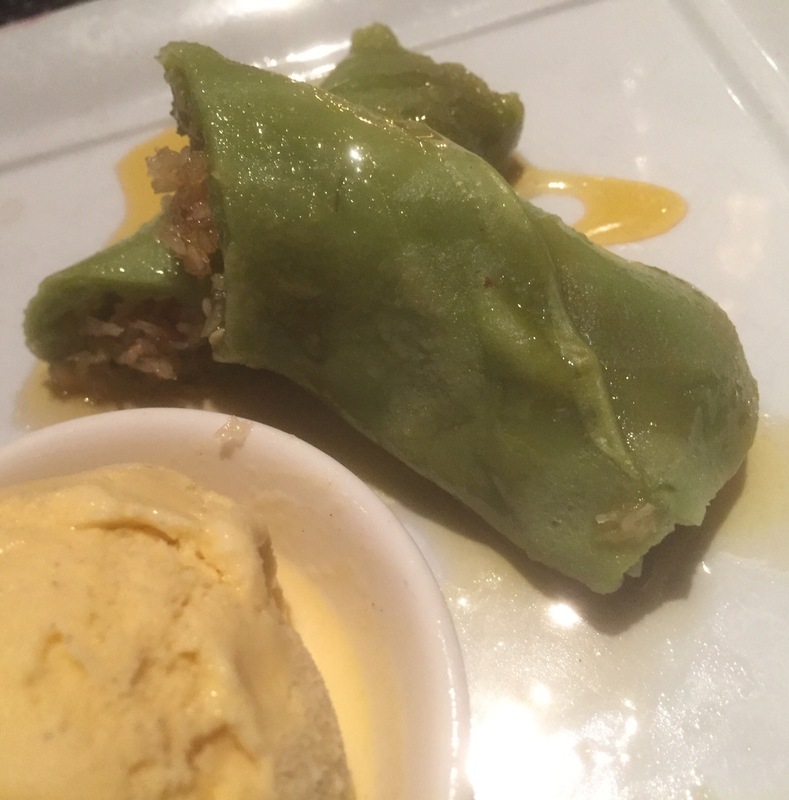 I was invited to try out the vegetarian dishes at Metro Bar & Kitchen as They had asked me to have input in their Spring menu for Veggie Month. 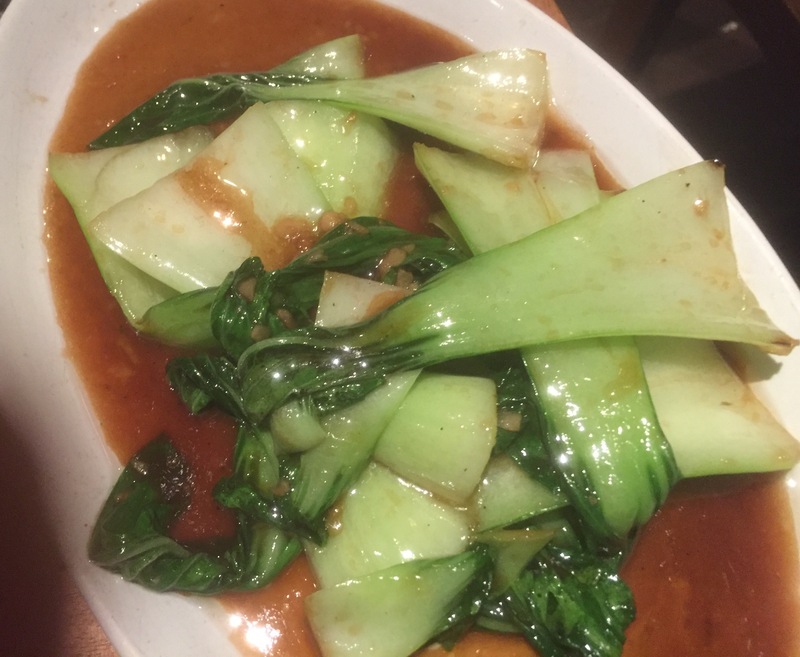 They have introduced some new dishes to their menu and expanded their daily and weekly specials to encourage more customers to try a non meat and fish option as well as attract more vegetarian customers. 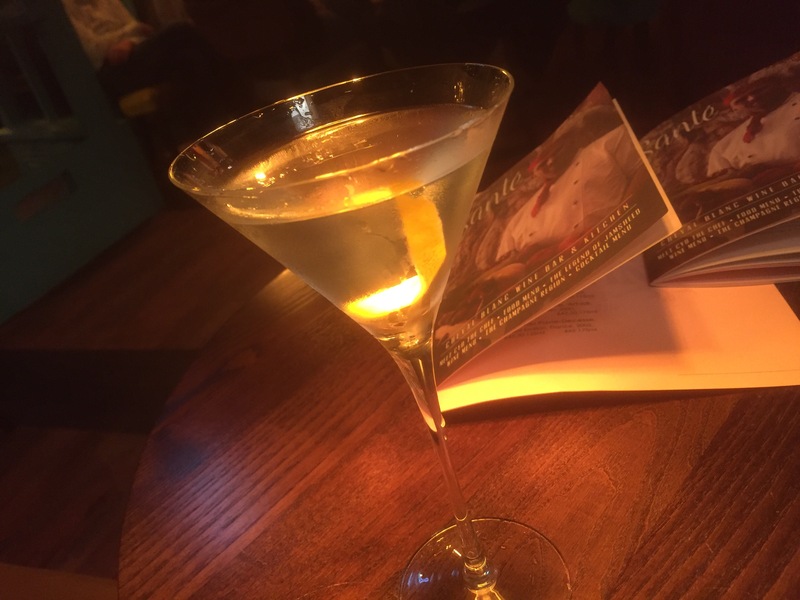 We began in the smart and relaxed bar area with a glass of Prosecco, which is lively but unobtrusive area and we felt was a good place to begin the evening if dining at Met Bar & Kitchen. Once seated at the table in a smart booth section of the restaurant we ordered a Couple of cocktails: A Negroni and Margarita. 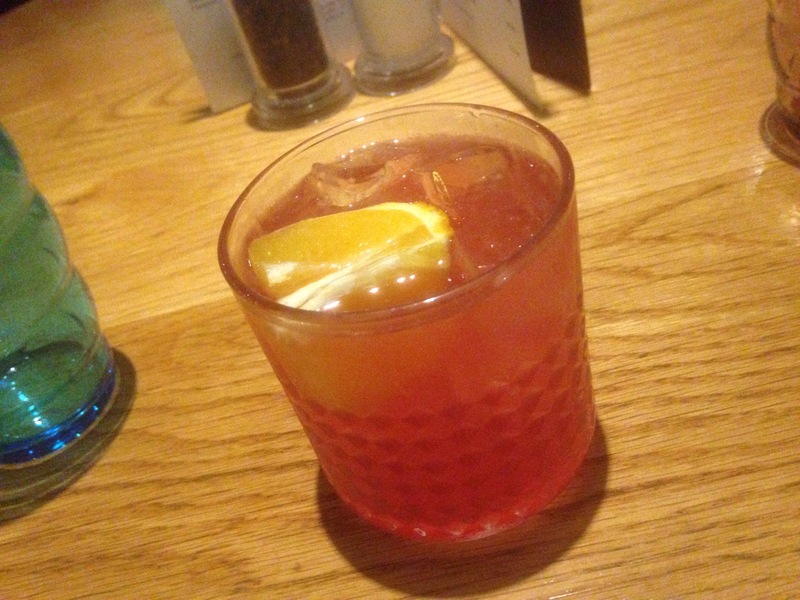 I was impressed with my Negroni, it had a good Campari kick with the complimented vermouth and was an aromatic aperitif of good quality, which would have been even better with less added ice. Ruth’s Margarita tasted fine, but disappointed her as as the rubbed salt around the rim of the glass was omitted, could it be classed as a margarita? 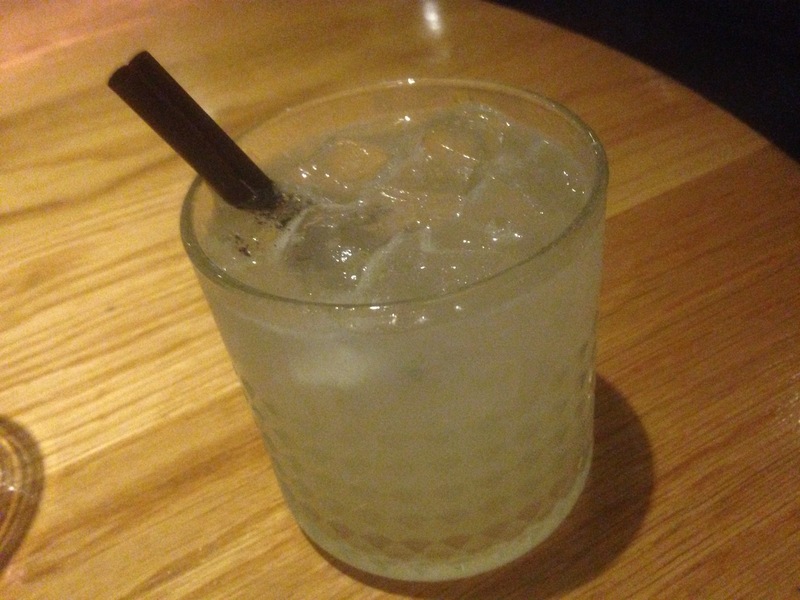 The flavours were good the tequila, and triple sec gave it a fresh and crisp zingyness. Negroni and Margarita: A nice couple. Ruth decided she was grazing on meat for the night. Good for her I say as she doesn’t eat it that much at home. I chose my starters off the specials menu. It’s with the changing specials that the bulk of the vegetarian dishes find themselves. So take my Roast Apple and Parsnip Soup. 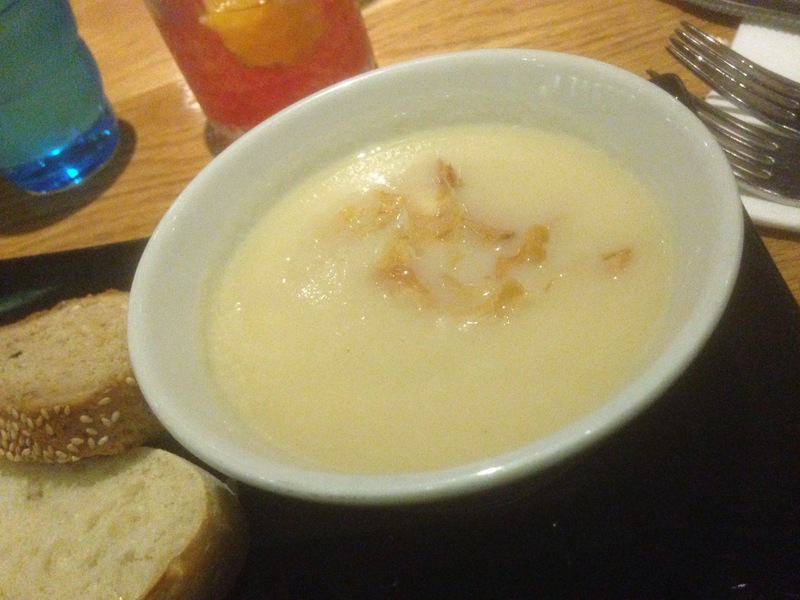 A soup that was full of good warming flavours, mellow, but zingy, the biggest compliment I could give it was that it reminded me of my Mums version and was a delectable starter of sweet parsnips and tangy apples, creamy and smooth. Lovely. 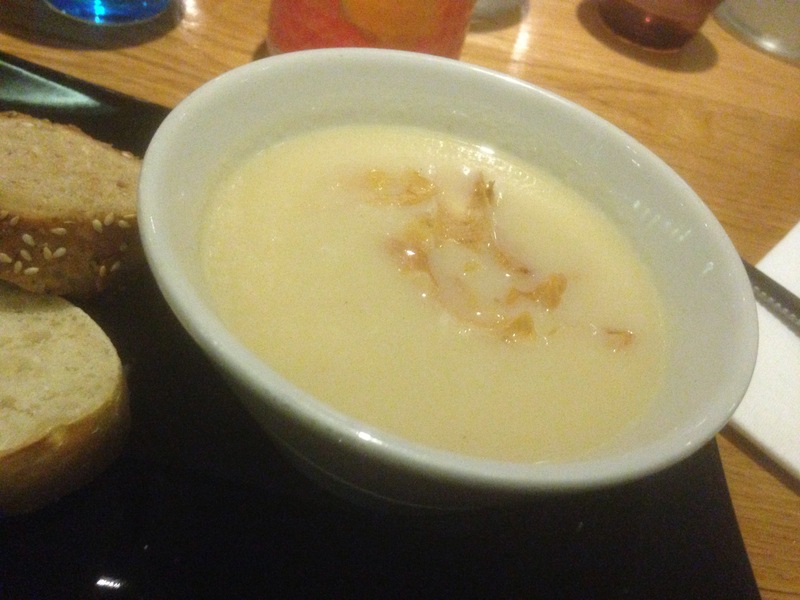 Roast Apple and Parsnip Soup. Usually when I find a curry on a menu outside of an Indian restaurant I wouldn’t choose it. Partly because we eat a lot of curries at home and Ruth in particular makes many superb Vegetarian curries. So what attracted me to this one? Well partly because it was a Goan Curry from Goa and not often found on general menus, and partly because it has a coconut spiced masala (gravy) base which gives it a unique flavour. I love coconut in curries or stews. 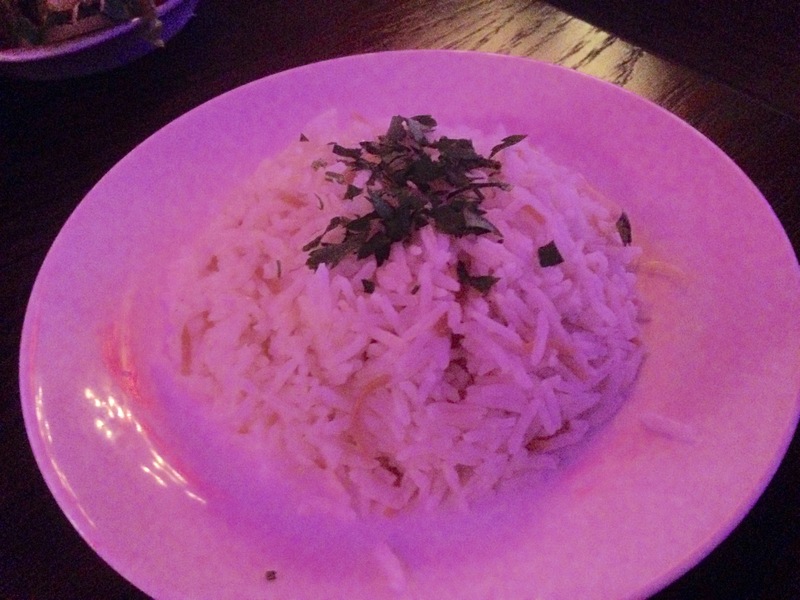 With its gentle spices it was a very flavoursome curry, a lovely glowing but light colour, gave it an attractive depth. Spicy rather than hot, with a nice chilli hit, the curry may have benefited from steamed or basmati rice as an option as the Naan was only ok, and a bit soggy underneath. A lovely veggie option that wasn’t oily or fatty, but tasted healthy, comforting and light with the addition of some nice tender squash (always a winner) with the subtle hint of coconut. A taste of coastal scents and sunshine. The desert menu at Met Bar & Kitchen has some good options so proved to be quite a lengthy process to decide what to choose. 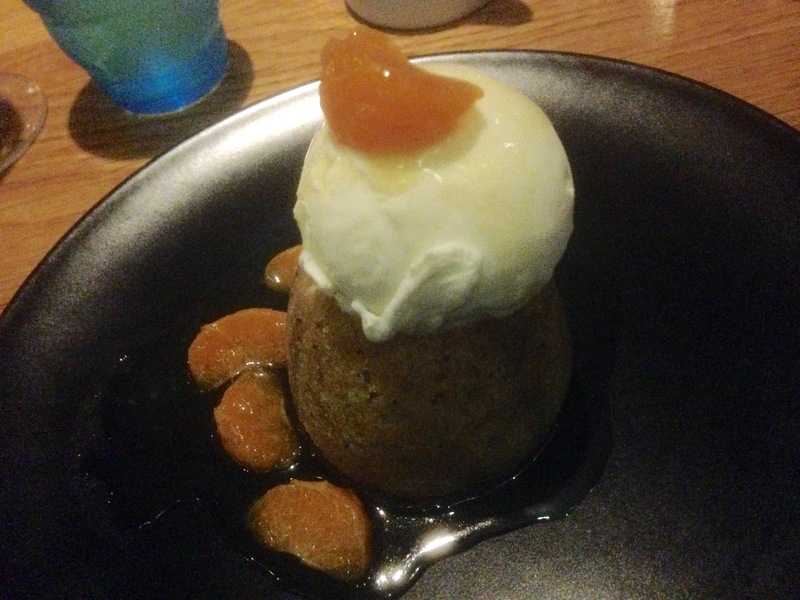 Eventually, I chose the Steamed Orange & Poppy Seed Sponge, Clementine syrup, mascarpone ice cream. The sponge, light, airy, though could have done with more clementine intensity for me, to give it an added luxurious lift, though it did provide a lightly scented aroma, which was nice. The Mascarpone ice cream offered a smooth and grown up, creamy delight to the pudding. Excellent. 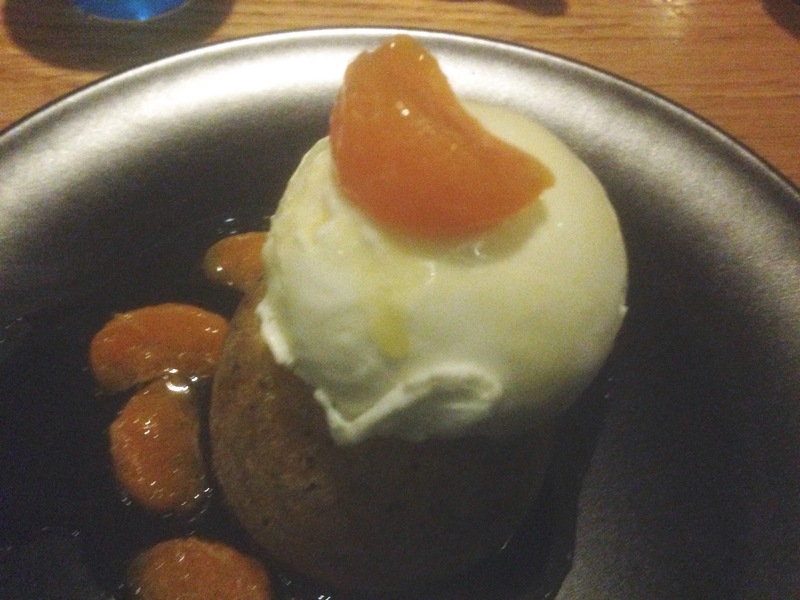 Stewed Orange & Poppy seed sponge, clementine syrup, mascarpone ice cream. 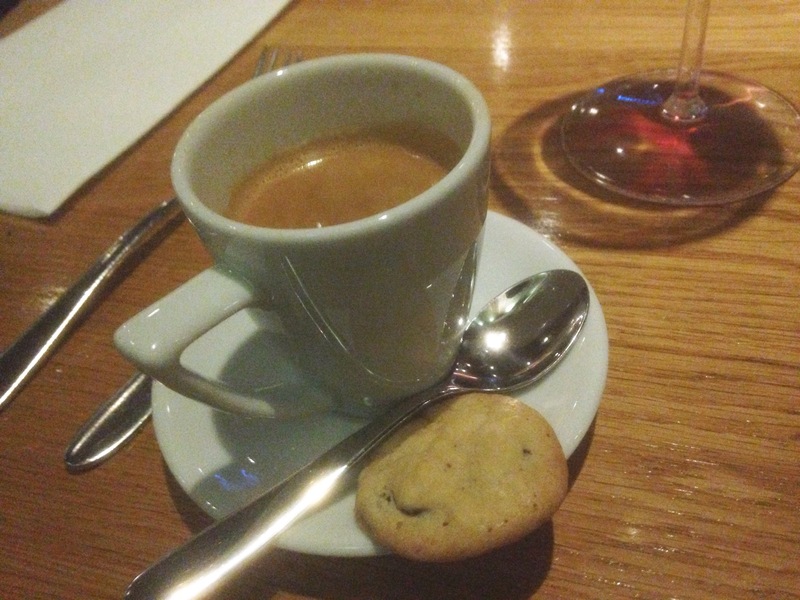 We also enjoyed a double espresso and Hennessy Cognac after our deserts plus two glasses of Argentinian full bodied Malbec with our main courses. 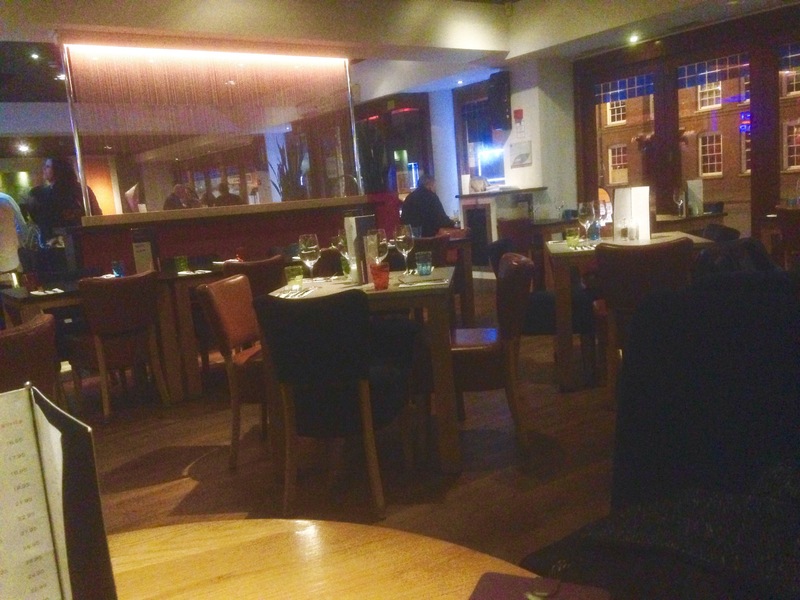 We were both very impressed with the Met Bar & Kitchen in Solihull. 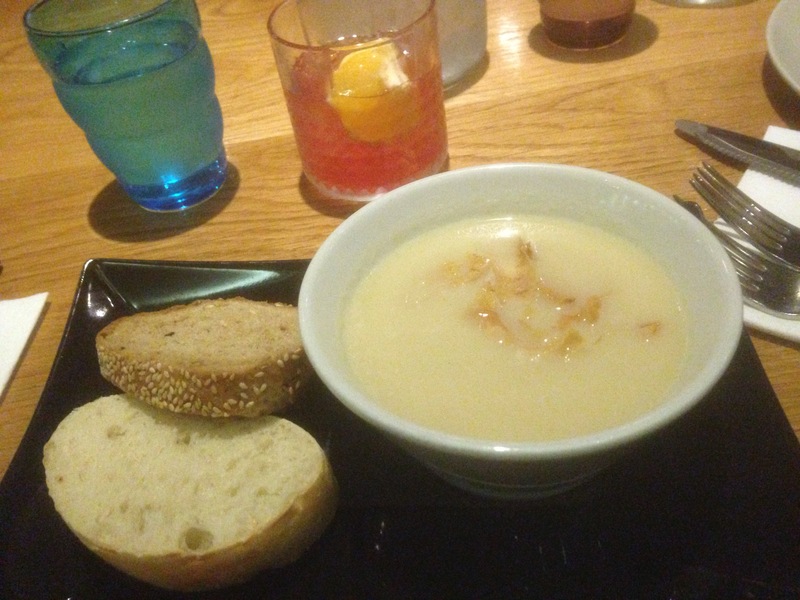 The Vegetarian dishes I ate were comforting, warming and very well made. Both good value with good strong punchy flavours it shows how you can make simple vegetarian dishes attractive and Moreish with a good culinary technique. What the Met Bar are not trying to do is divide diners or confuse them by creating food that is seriously complex, but instead creating classics with a twist that can appeal to non vegetarians too. It’s better to make dishes well than overdo bold dishes badly and they do this well on the whole. Credit is due to them for wanting to increase their Vegetarian options and I’d like to see this as been the begining of a journey not them reaching their destination in Veggie Month. What though sticks out is that the Met Bar & Kitchen is an excellent All day place to eat in Solihull town centre and been independent deserves praise for having the foresight to improve food and drink options in the area. Don’t go there expecting foraged and rare ingredients like at Nomad in Birmingham, but a place instead that delivers good solid food. For Vegetarians who like to eat out in Solihull, its surely long overdue. Met Bar & Kitchen have a happy hour from 12-7 every day with 2 for one cocktails. 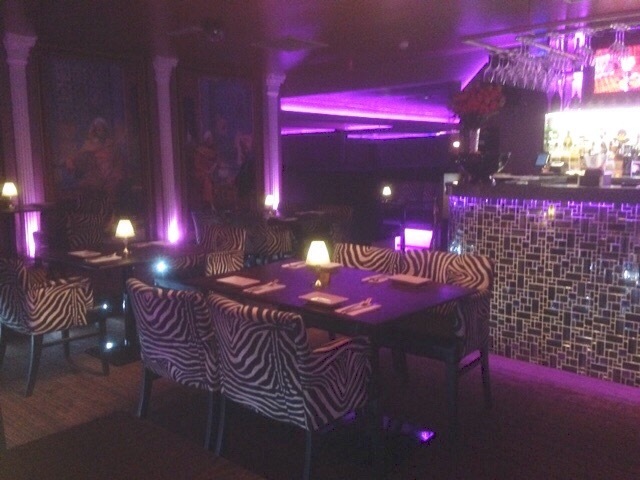 Met Bar & Kitchen, 680-684 Warwick Road, Solihull town centre, B91 3DX. 0121-705-9495. 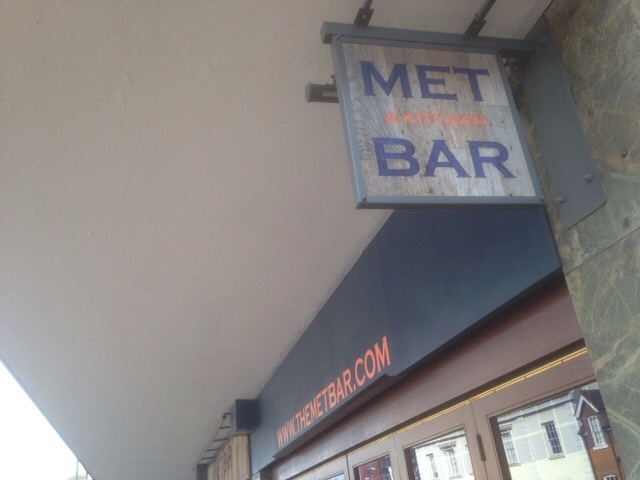 You can find The Met Bar & Kitchen on the Gastro Card: for details and offer. 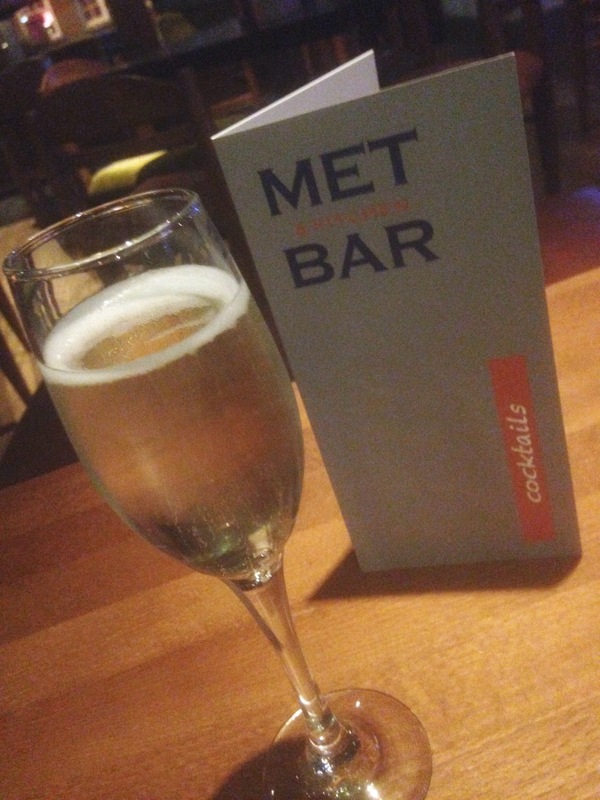 Ruth and I were invited to the Met Bar, our food and prosecco were complimentary. Other drinks were paid for. This doesn’t affect my honest opinion as a fair and honest review was required. 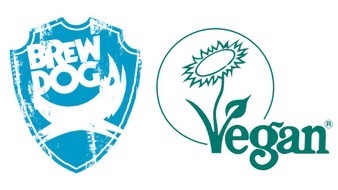 BrewDog beers to now carry Vegan Society Trademark. 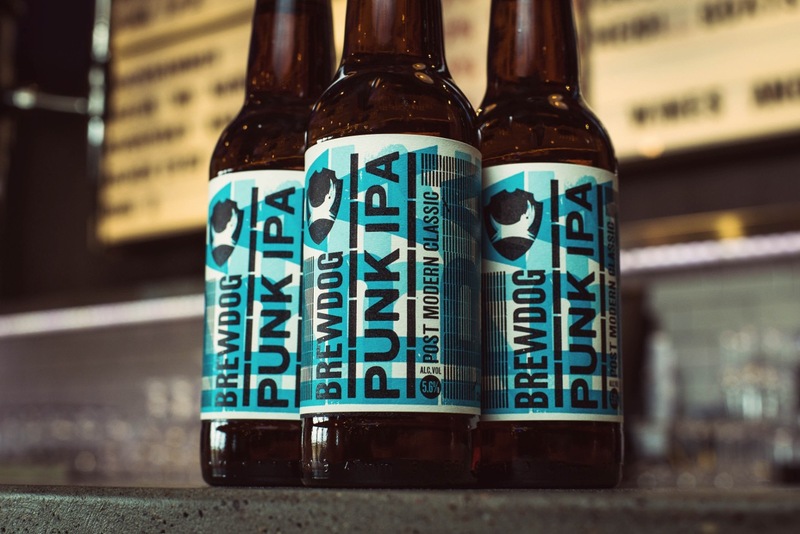 BrewDog is set to name 23 of its beers, including flagship beers Punk IPA and Five AM Red, Vegan Friendly and will carry The Vegan Society’s Trademark from This month (March). In place of isinglass, Brewdog use a “rock and roll centrifuge” (look it up, I had too) to clarify their beer, thereby making it suitable for Vegans and heavy metal fans who will be hoping this is not another rock and roll suicide to BrewDog. Also, all tap handles will be clearly labelled ‘vegan friendly’ too. Also available will be a wider range of gluten free and alcohol free Beers. 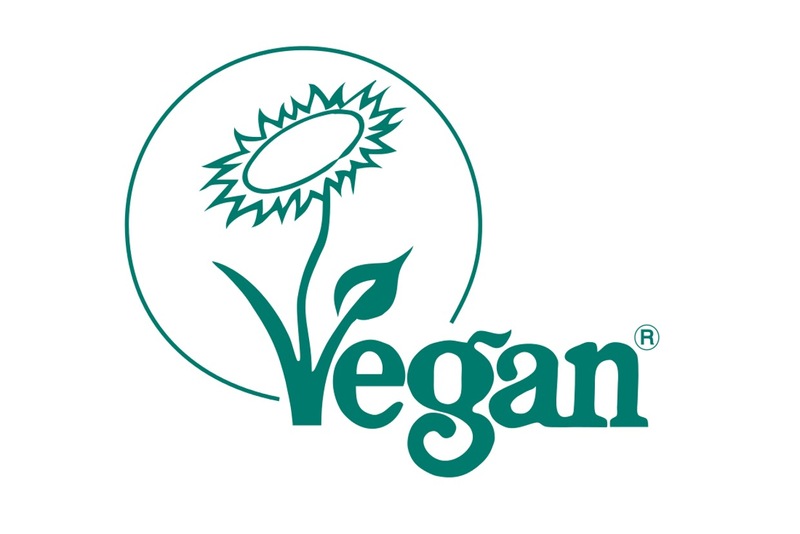 The Vegan Trademark is the internationally renowned standard for products that are free of all animal use, seen on products since 1990. BrewDog opened its first bar in 2010 and now has 30 bars across the UK. Hopefully this will be a trend that others may follow. One of my veggie foodie wishes would be for clearer labelling on bottles and for beers sold on tap in bars and pubs. It’s time to progress in this area. Birmingham’s BrewDog is located at 81-87 John Bright Street, near New Street Station next to Turtle Bay restaurant and almost opposite the fab and top bottled beer bods Cherry Reds. Thanks for reading, and happy drinking. 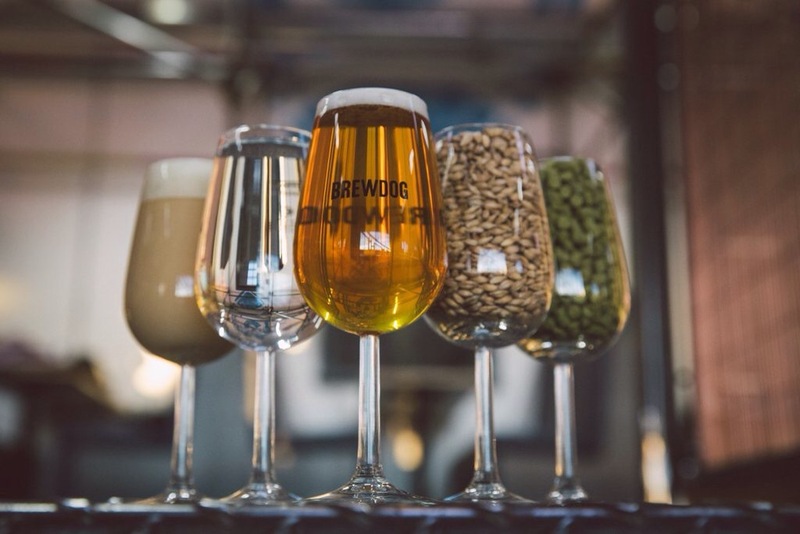 All photos courtesy of BrewDog and The Vegan Society.